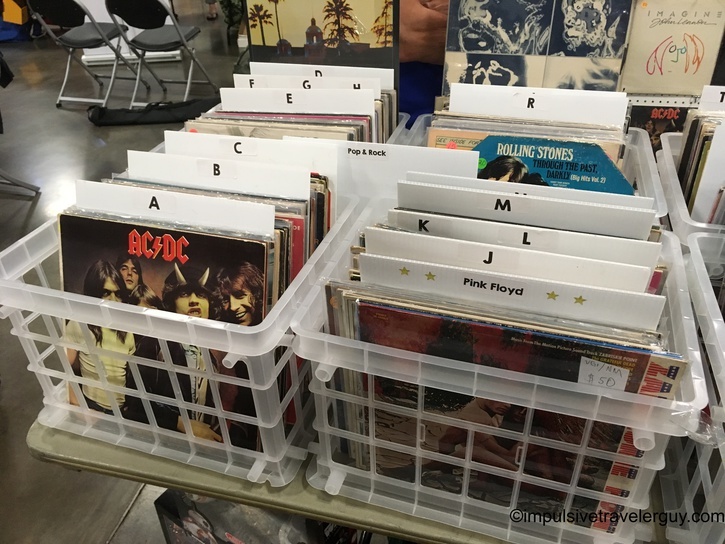 As you probably know, I like a lot of different music. 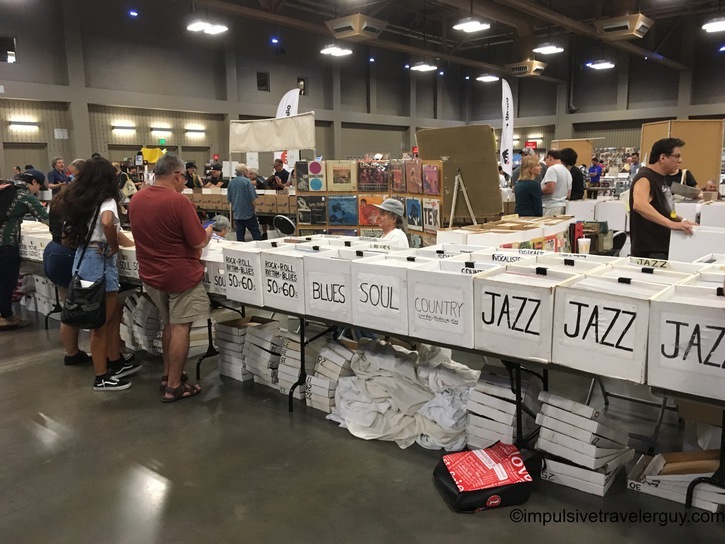 That’s why when I took a month off in July, I hit up two music festivals (Bluesfest and RockUSA) in about a week and a half from each other. 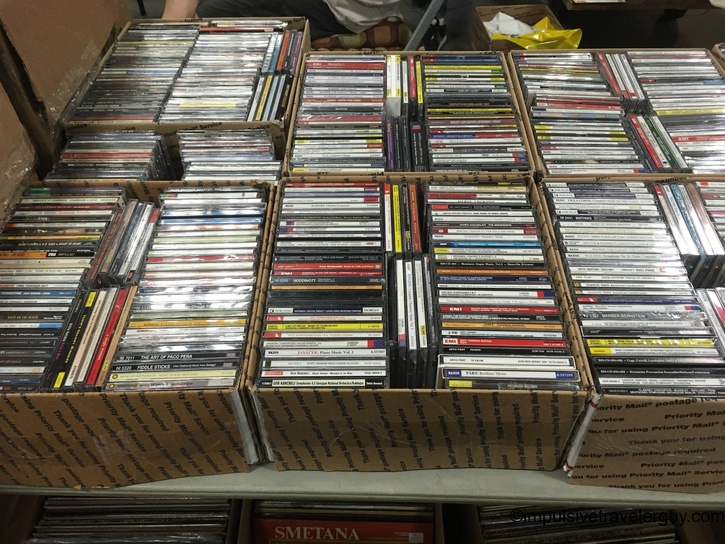 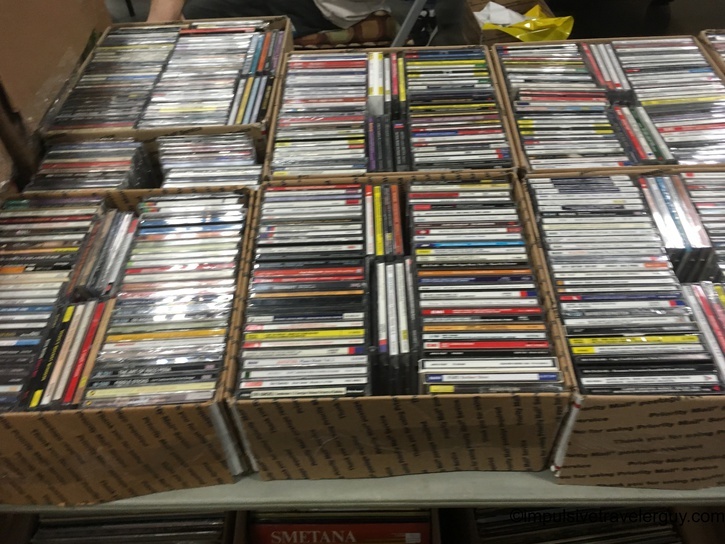 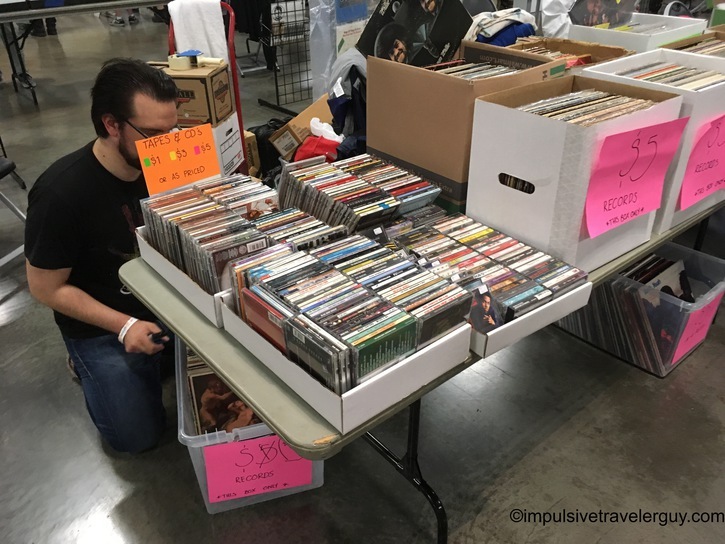 I am a big fan of CD’s and will hit up places like Strictly Discs or Piranha Records, but also have been known to stop by pure record stores like New Day Records. 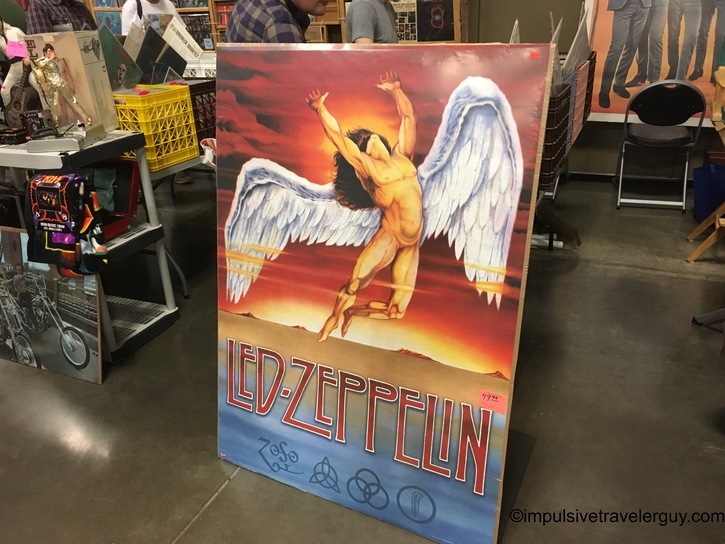 With that being said, Facebook marketing got to me again. 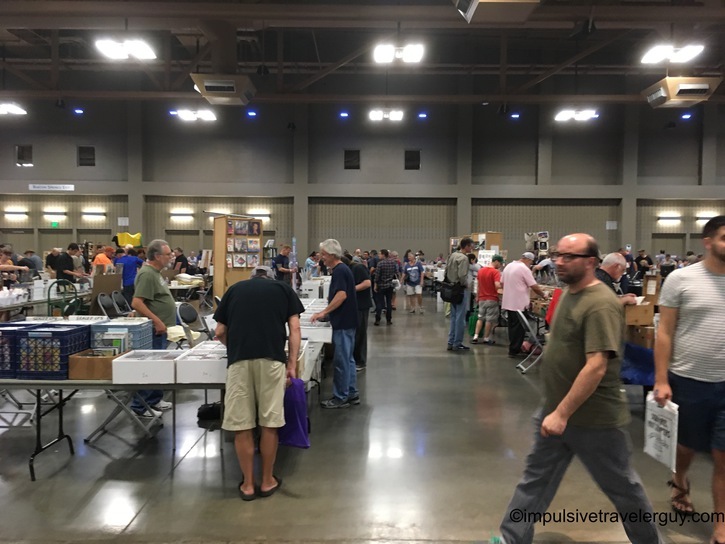 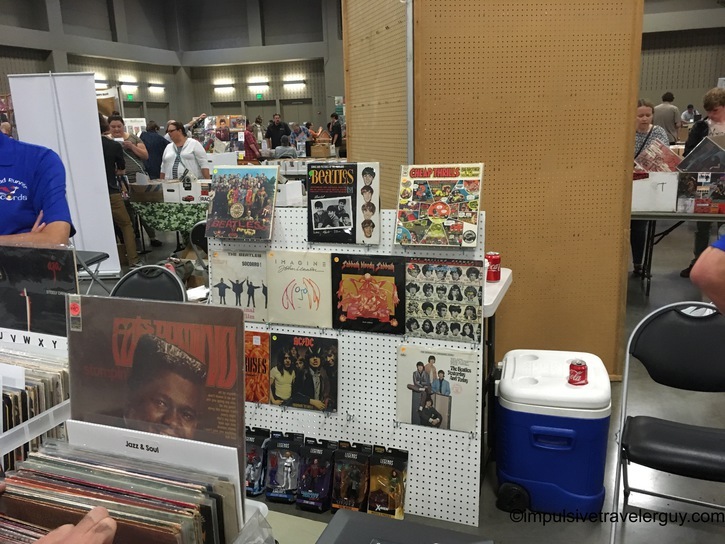 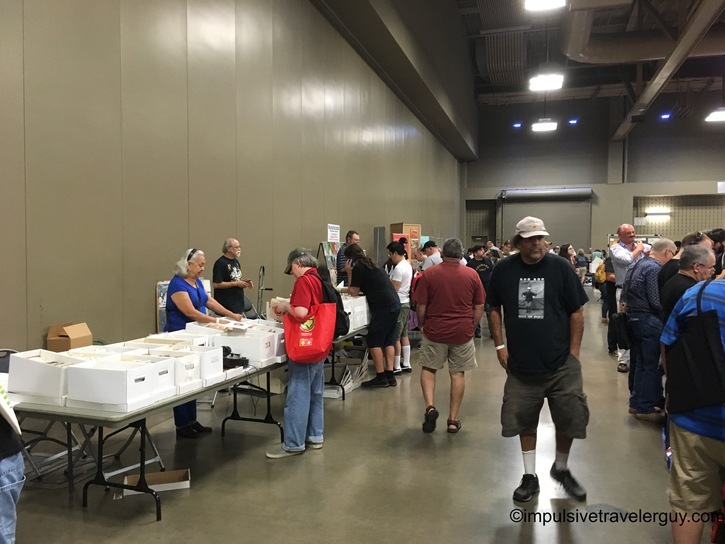 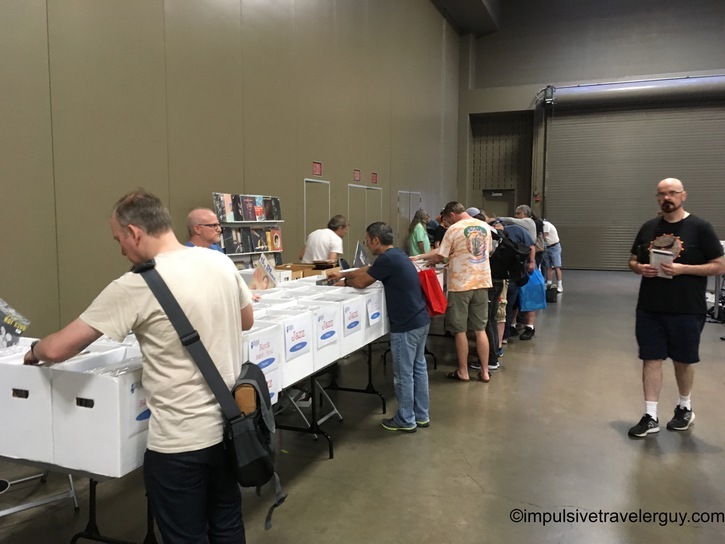 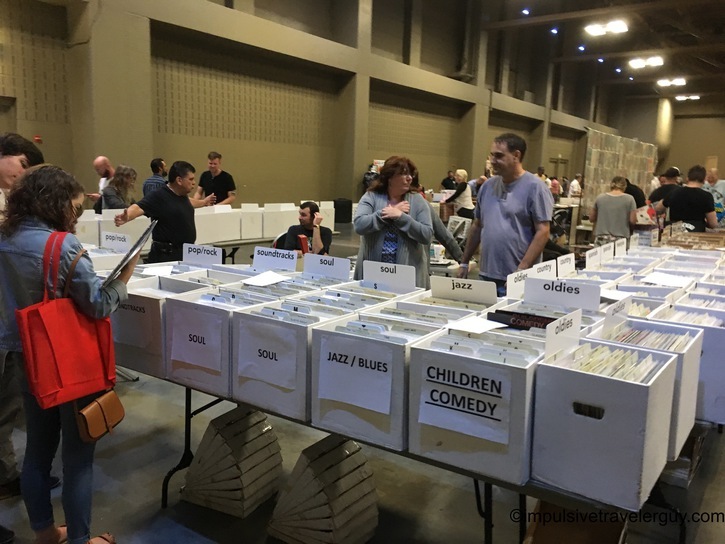 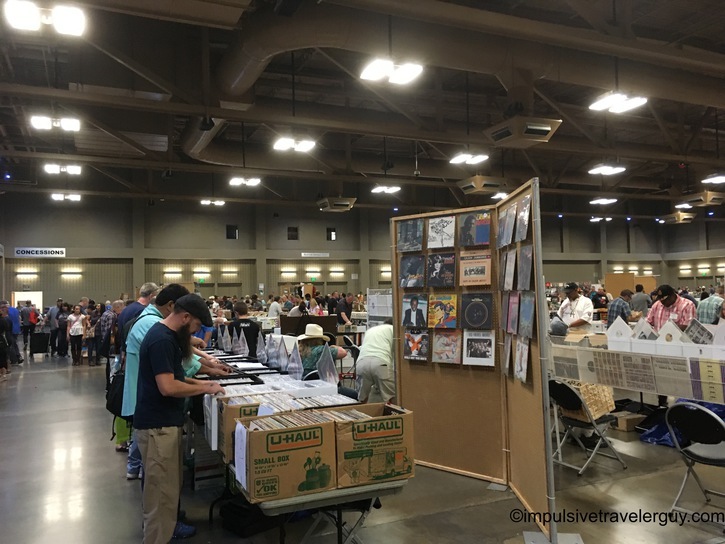 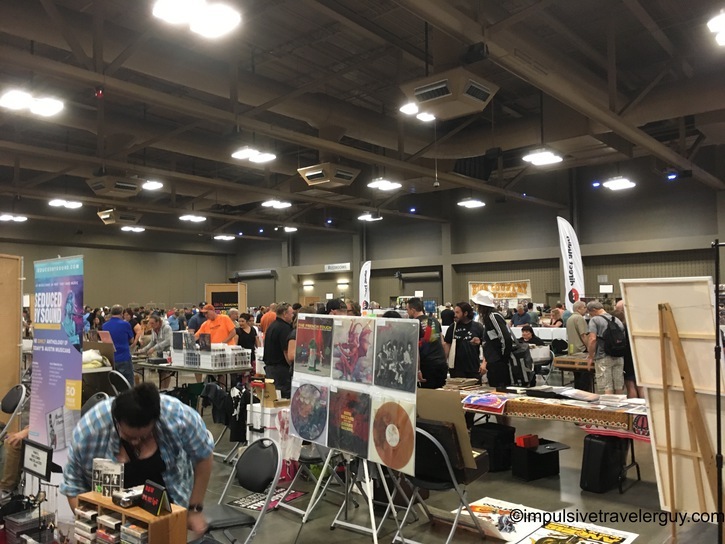 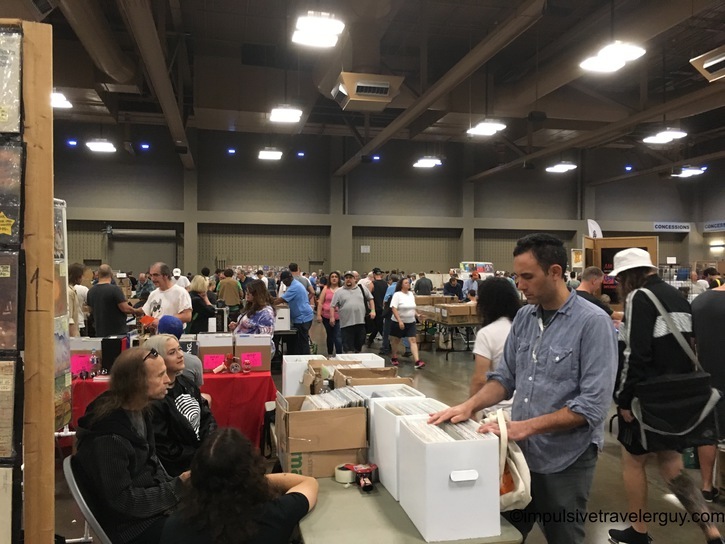 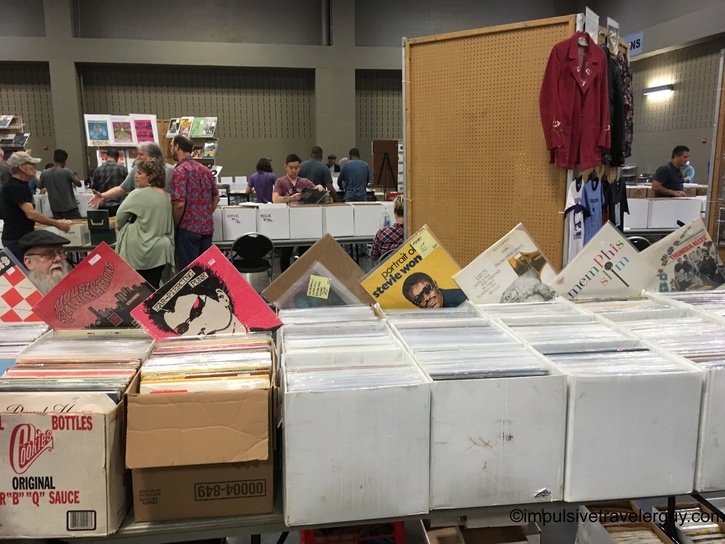 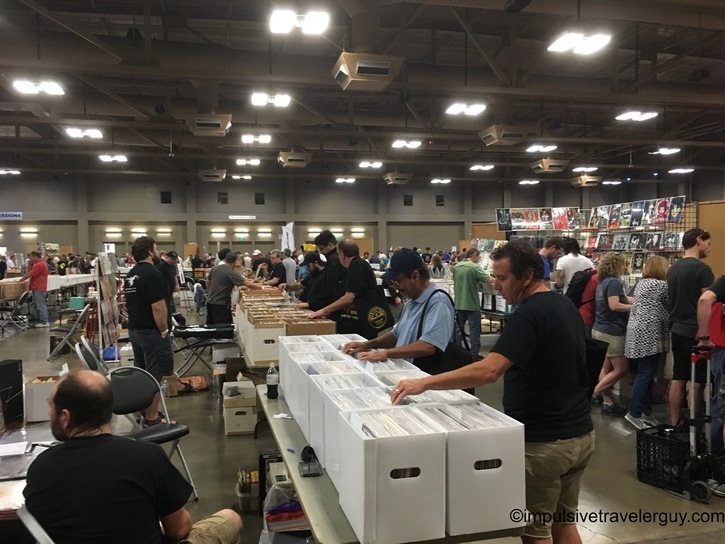 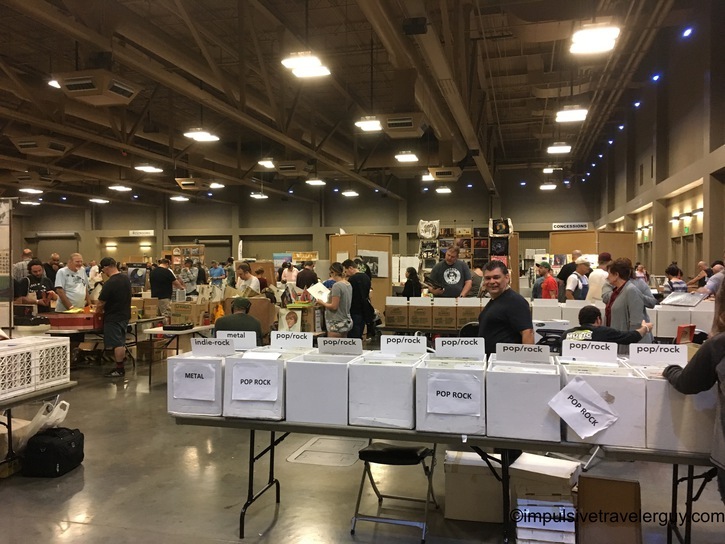 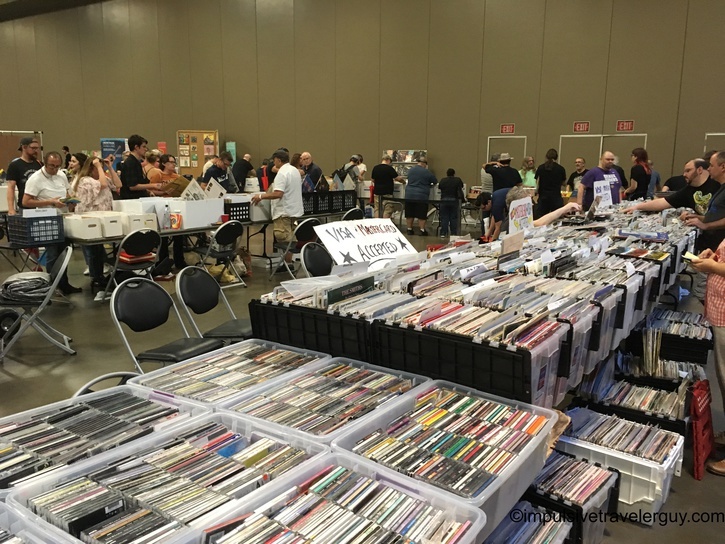 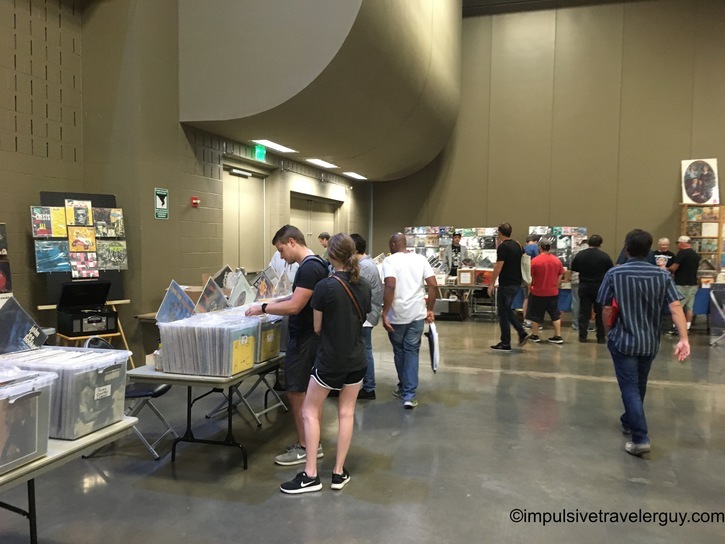 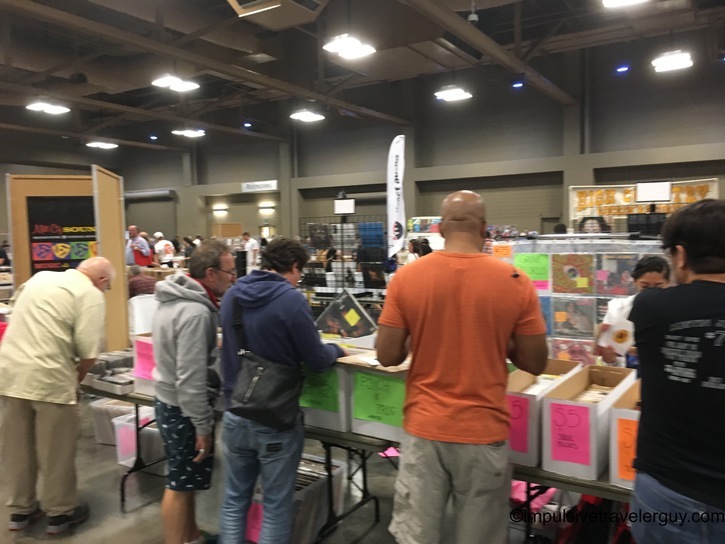 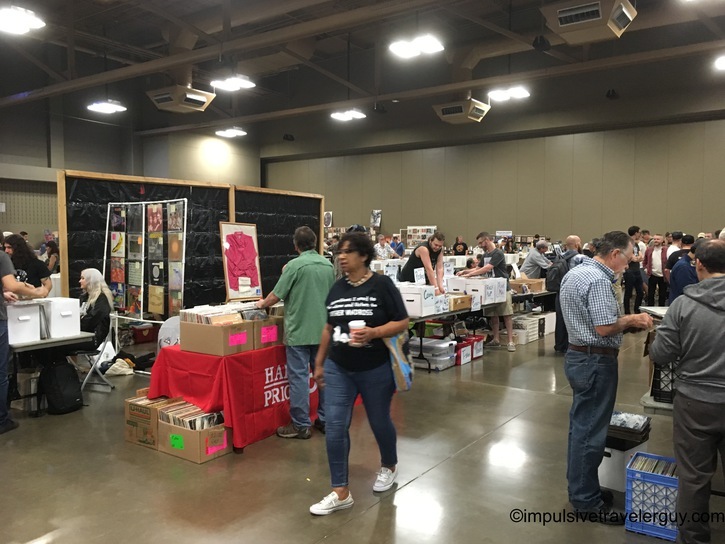 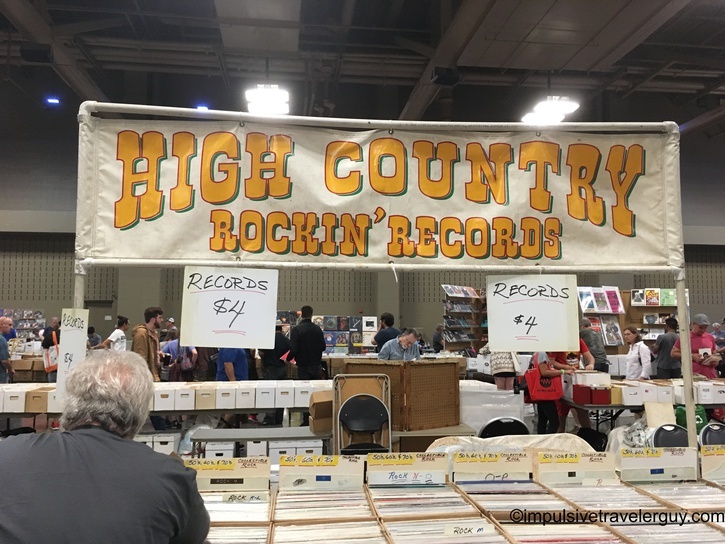 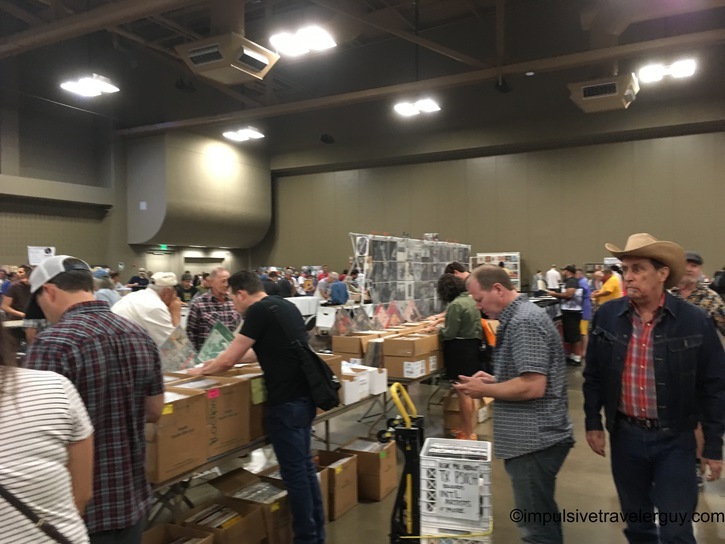 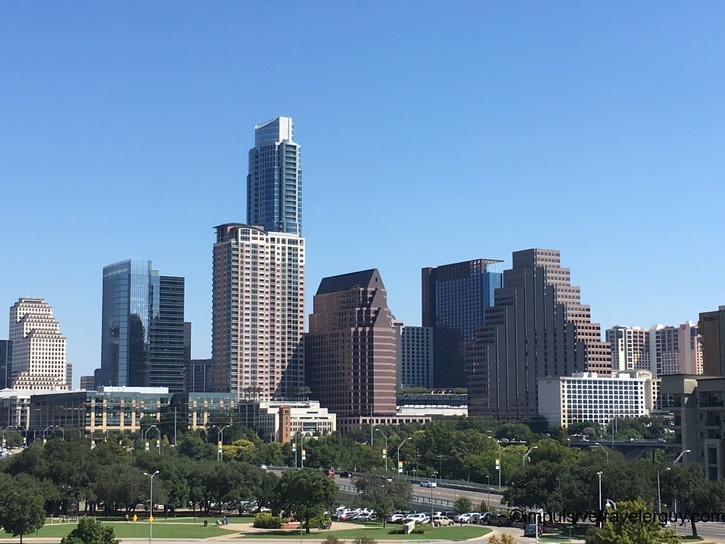 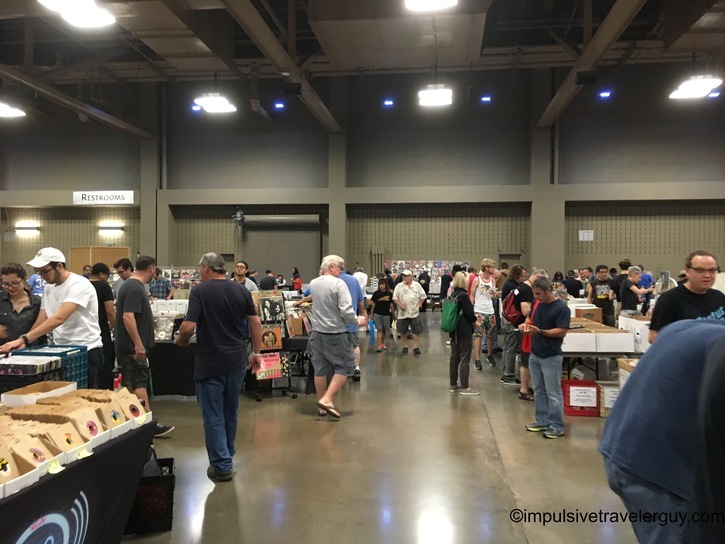 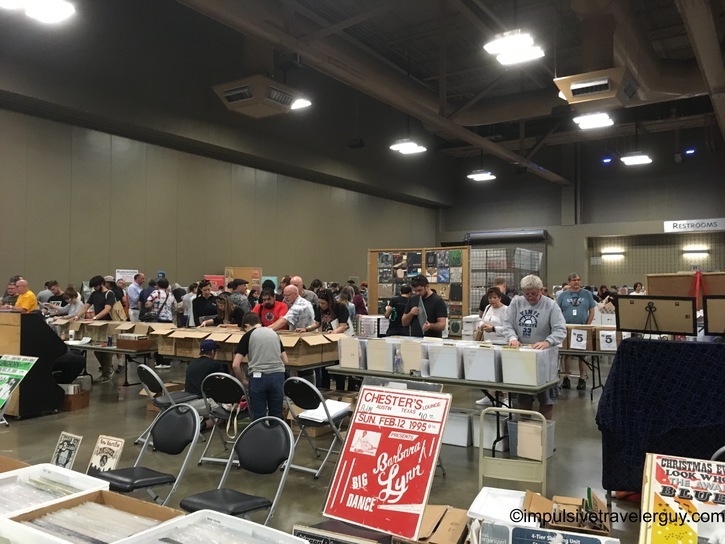 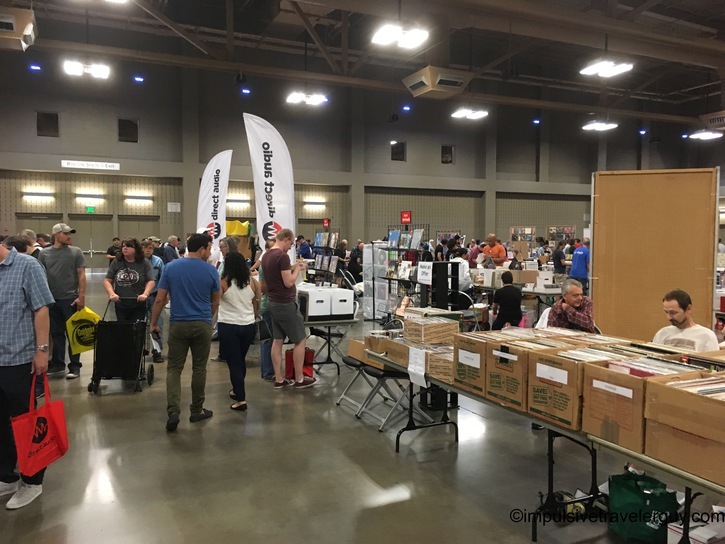 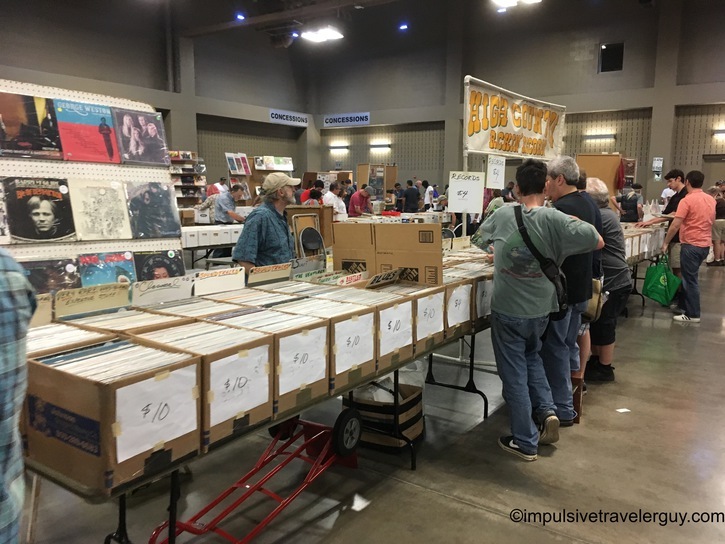 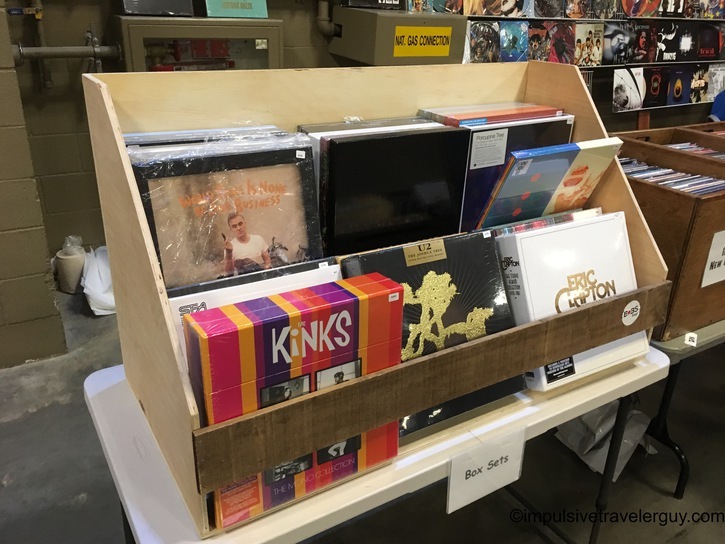 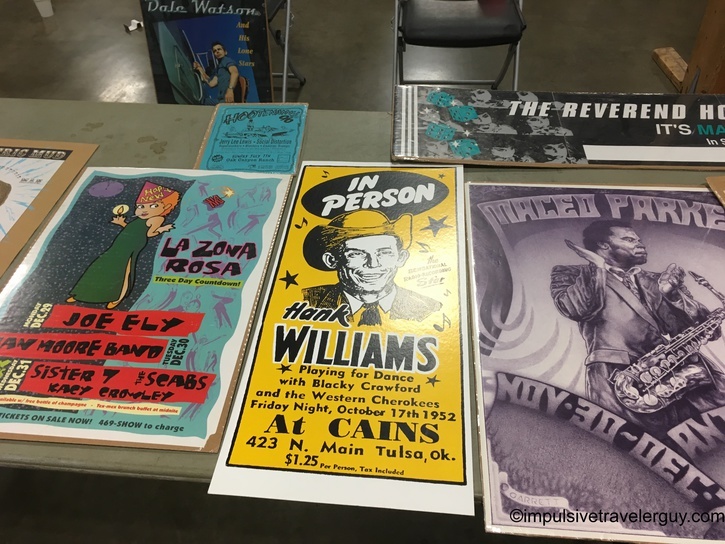 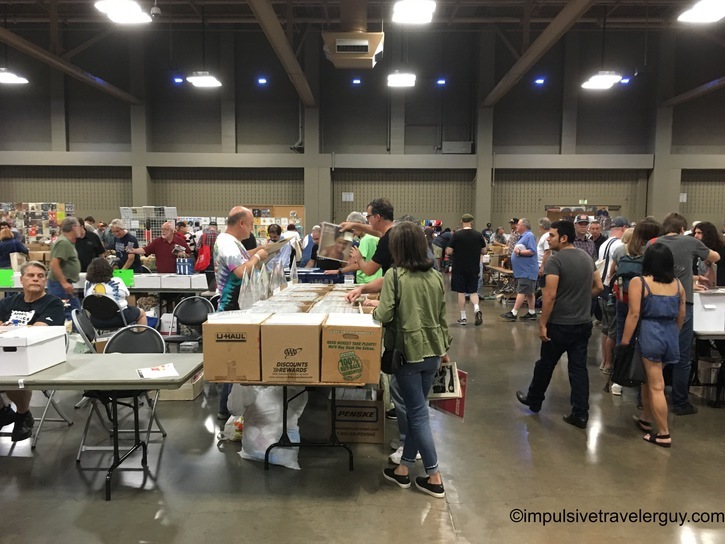 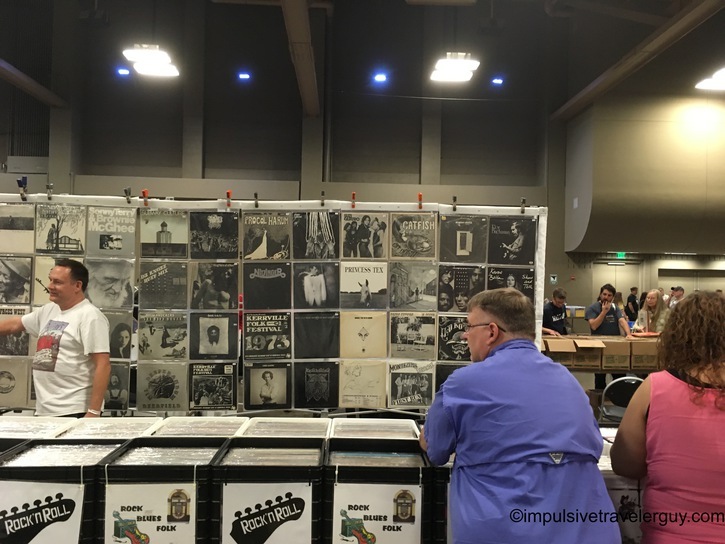 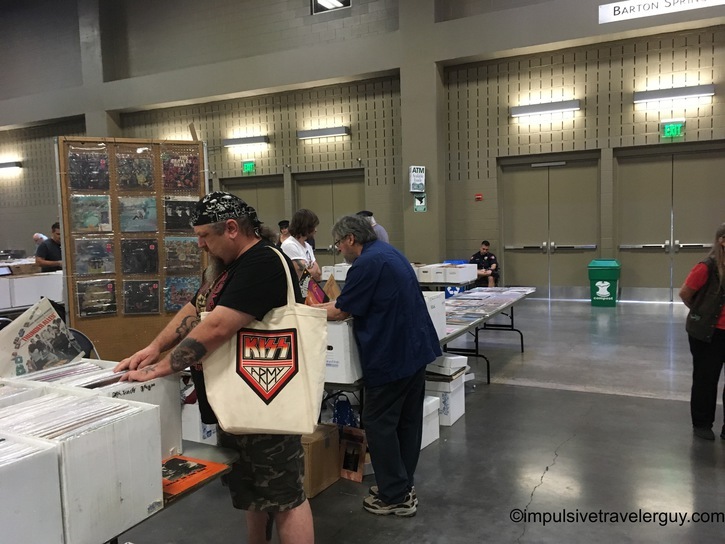 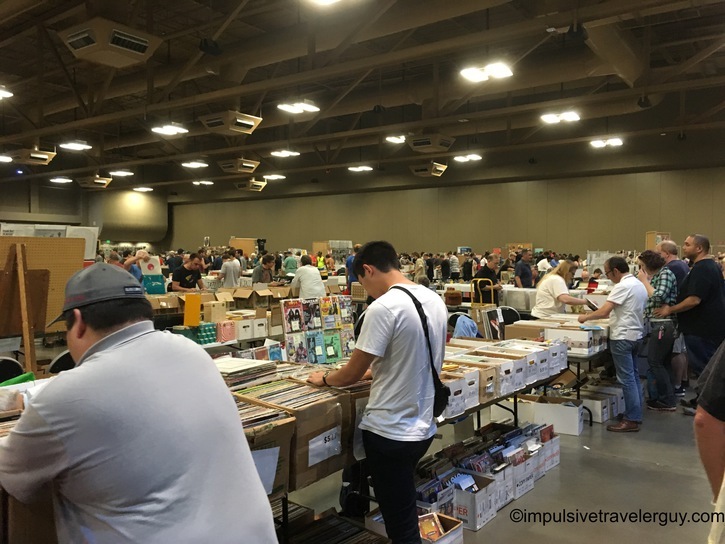 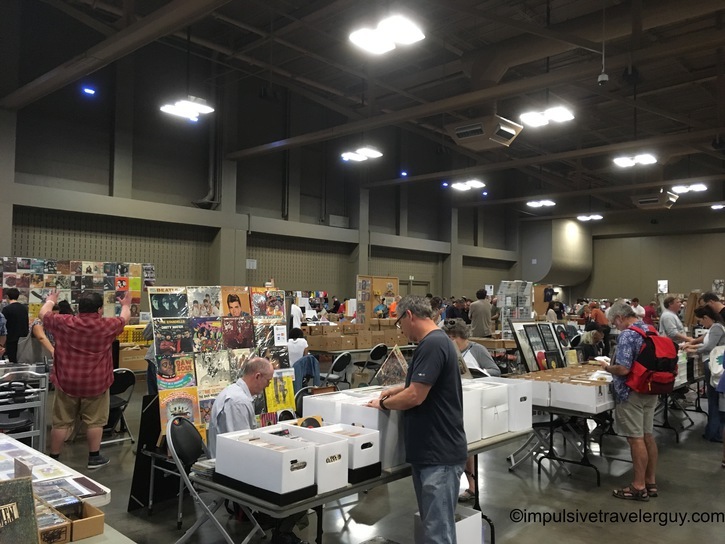 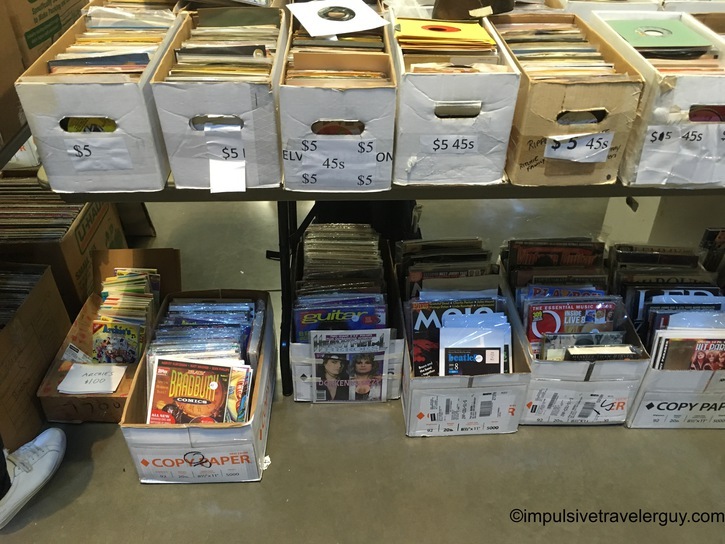 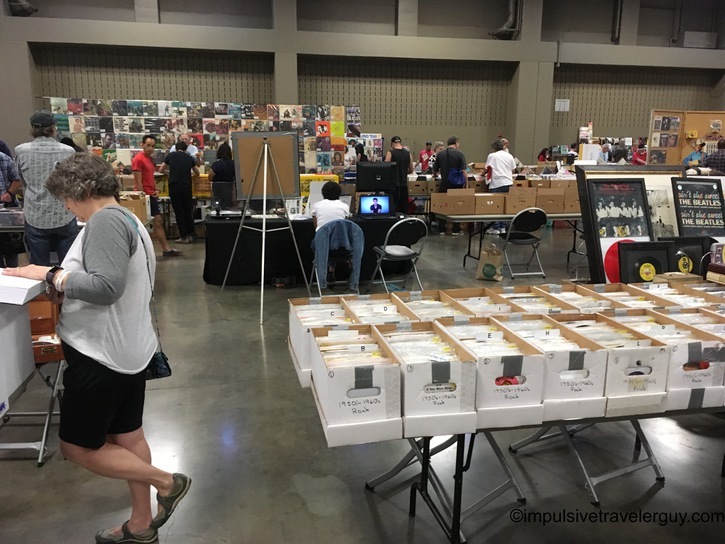 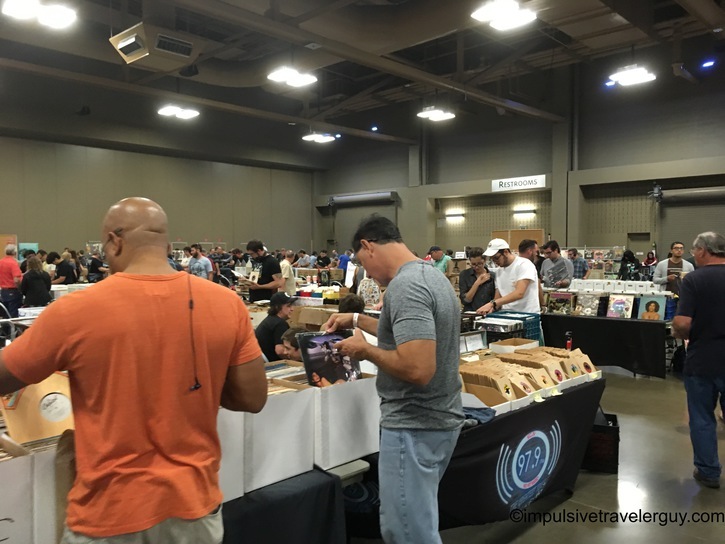 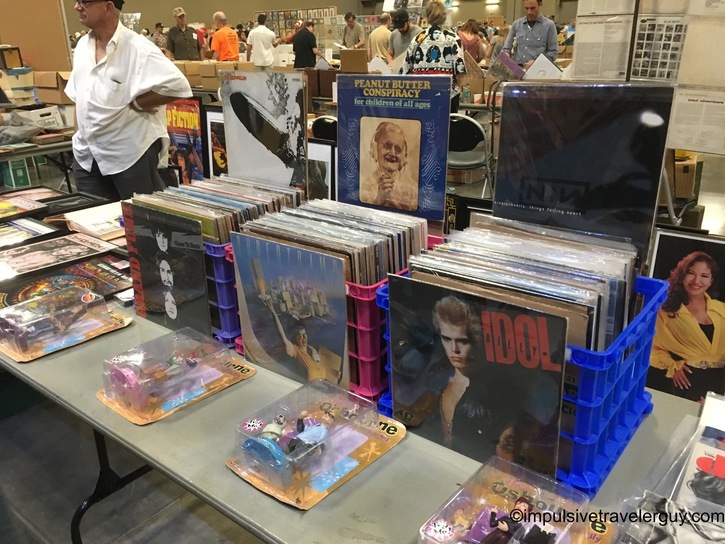 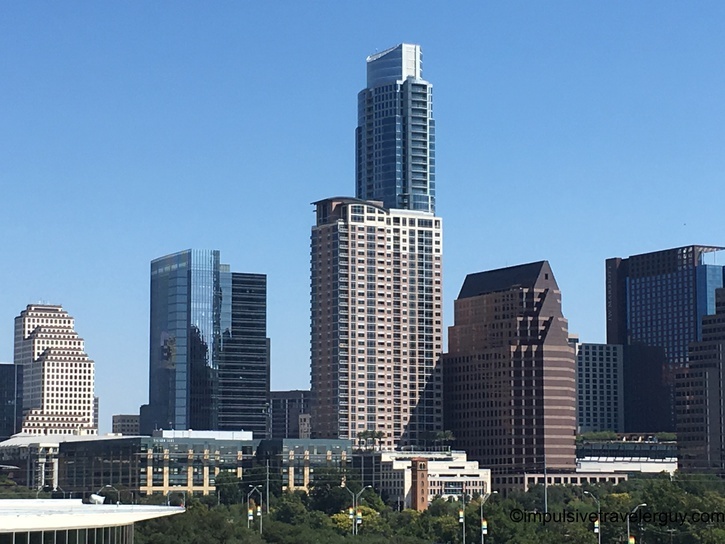 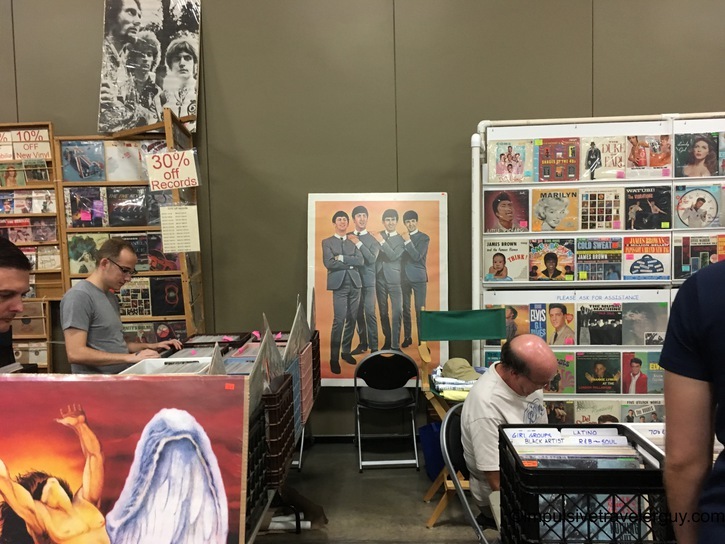 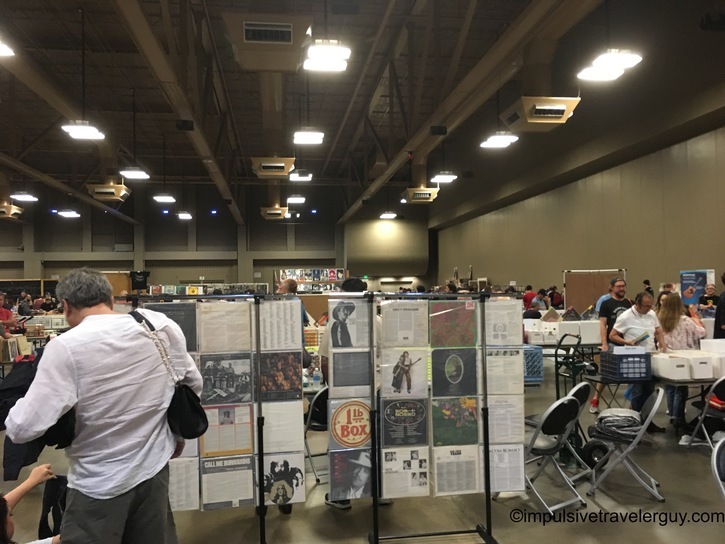 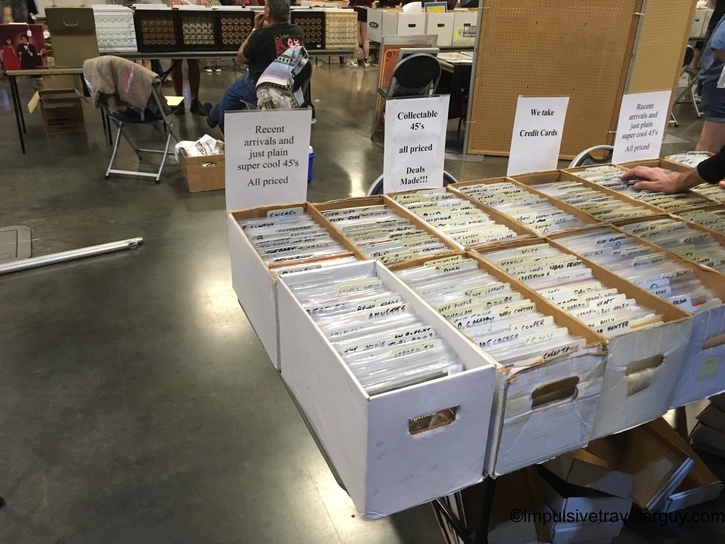 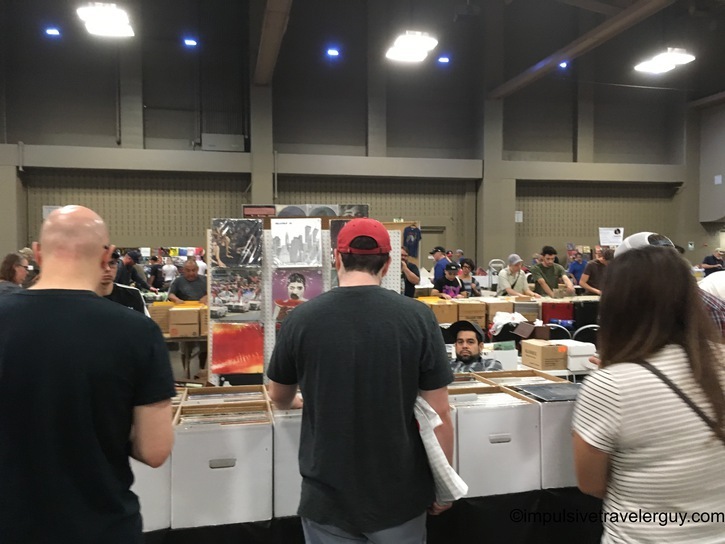 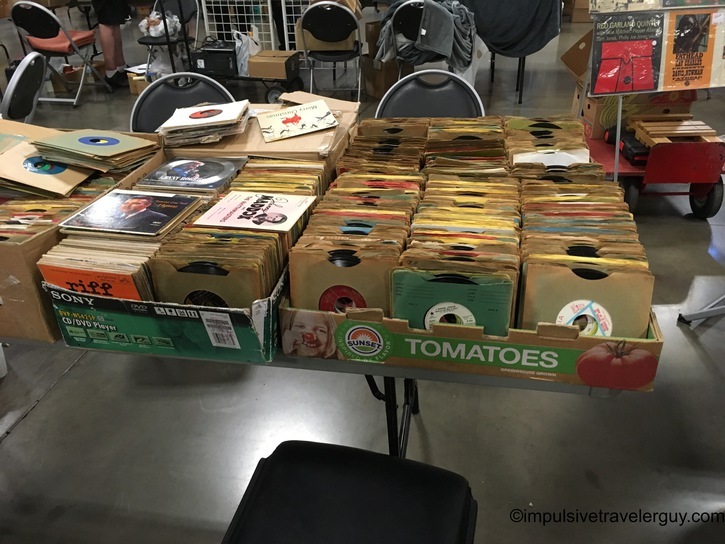 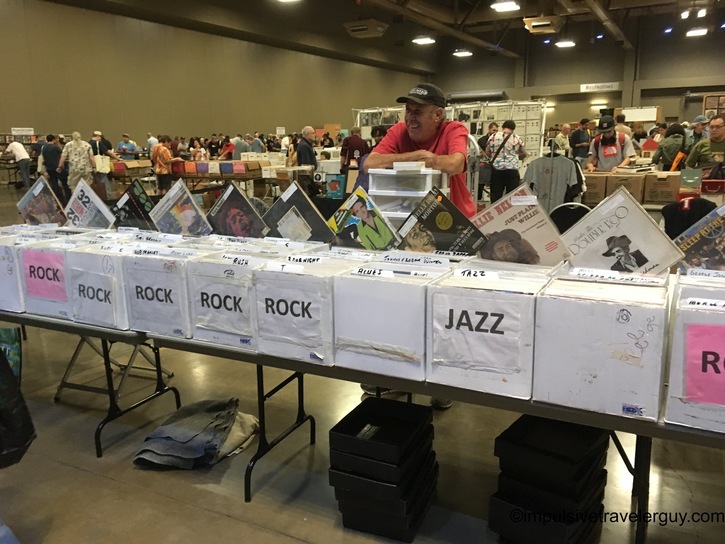 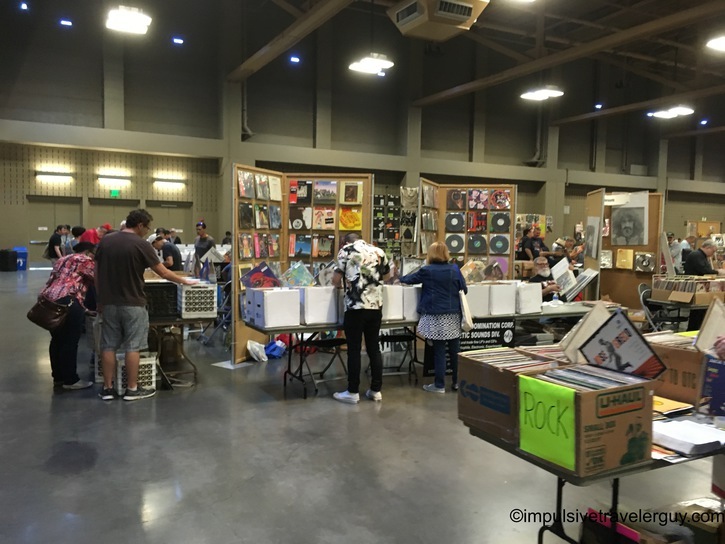 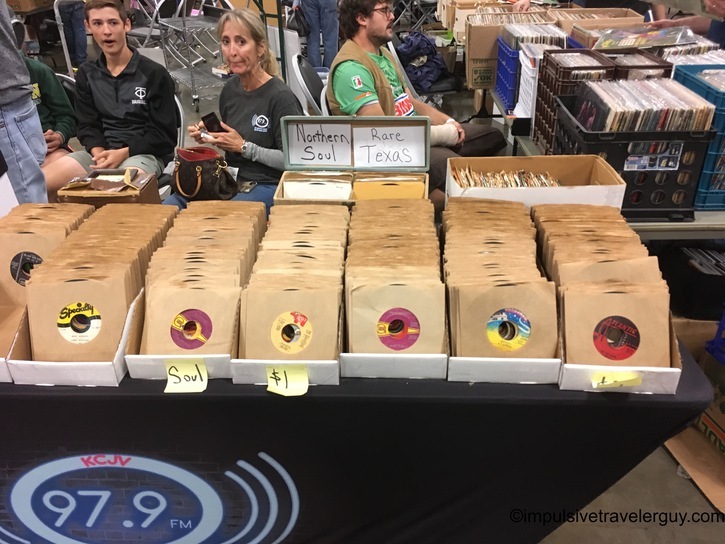 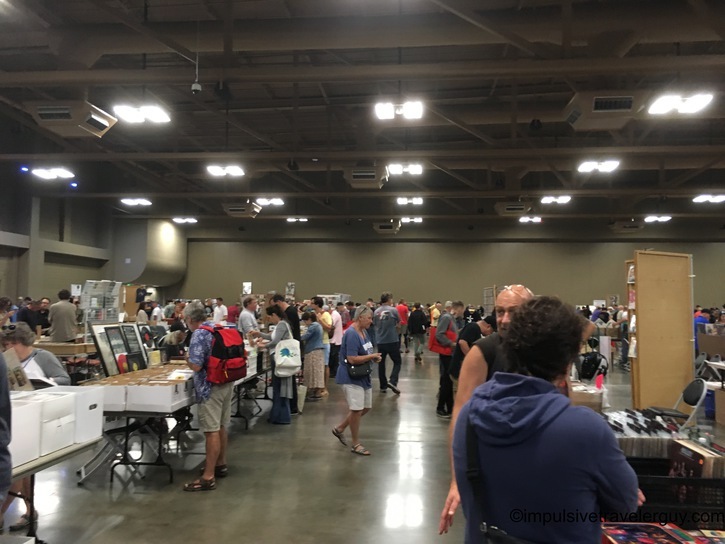 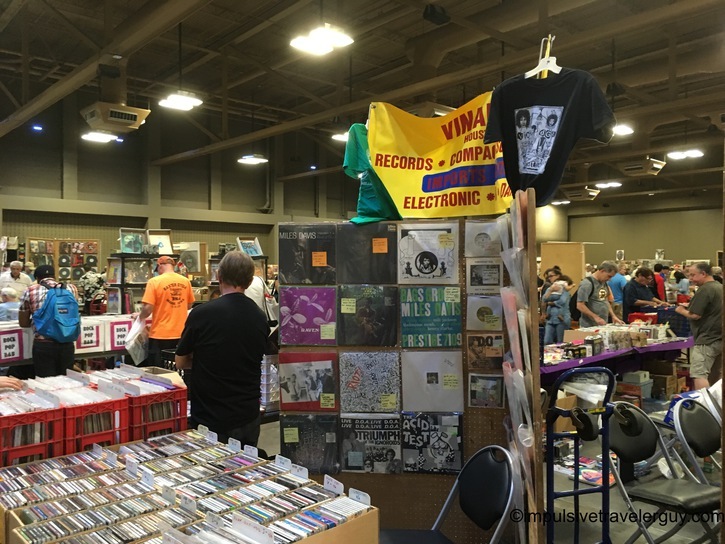 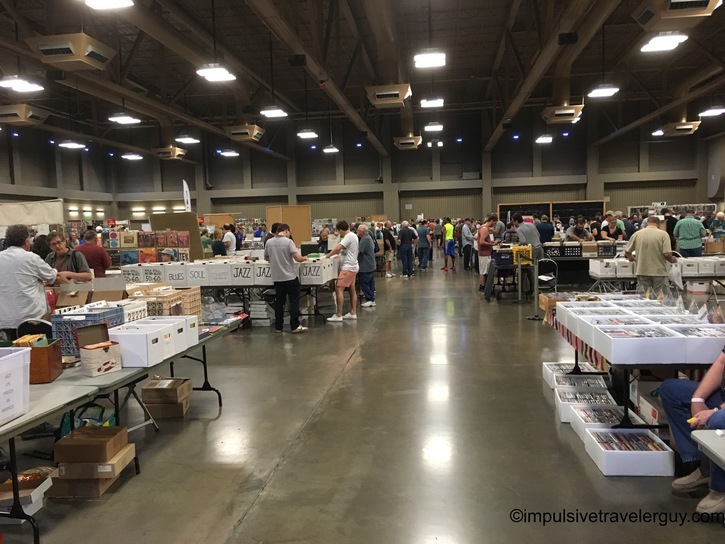 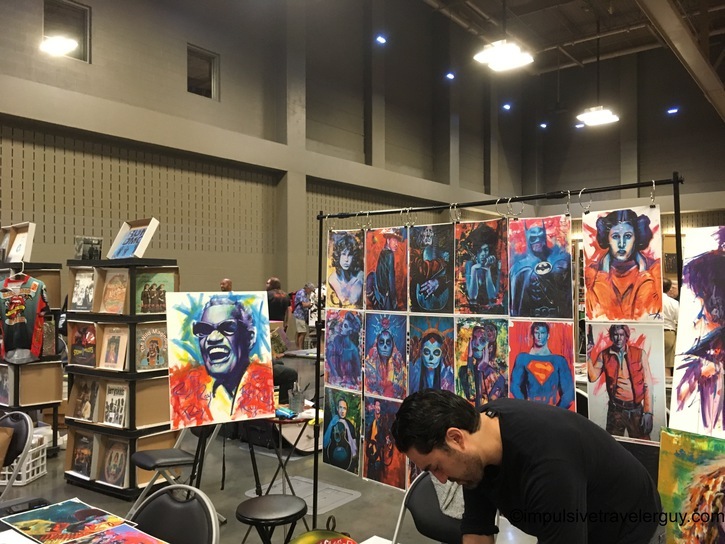 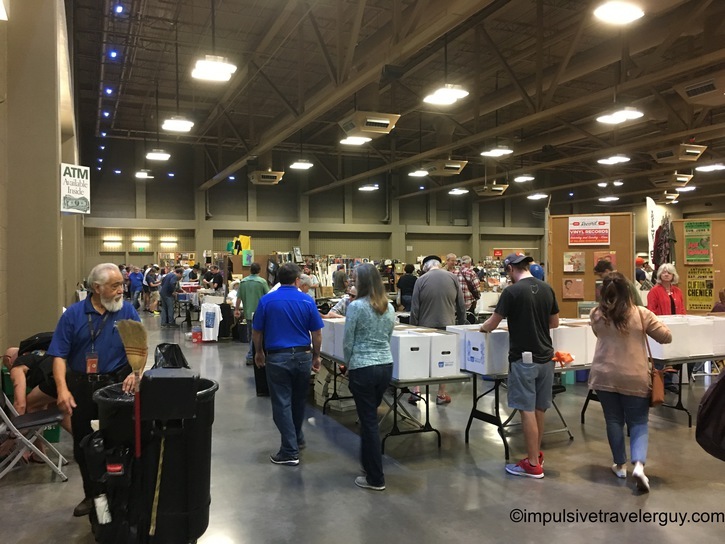 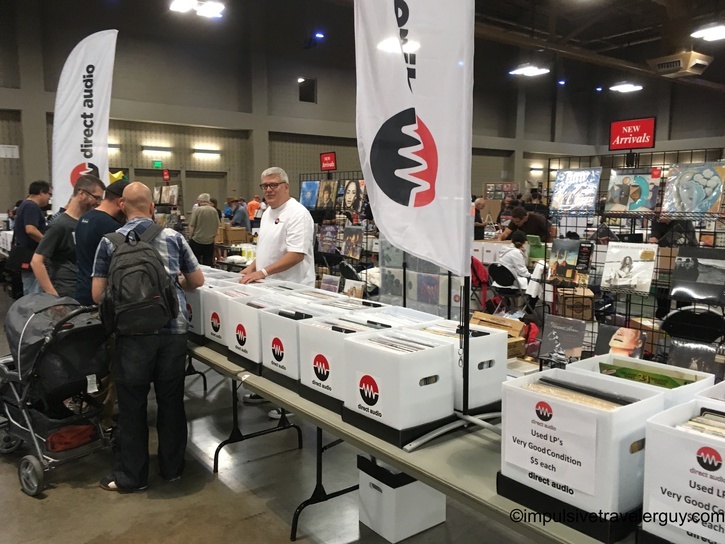 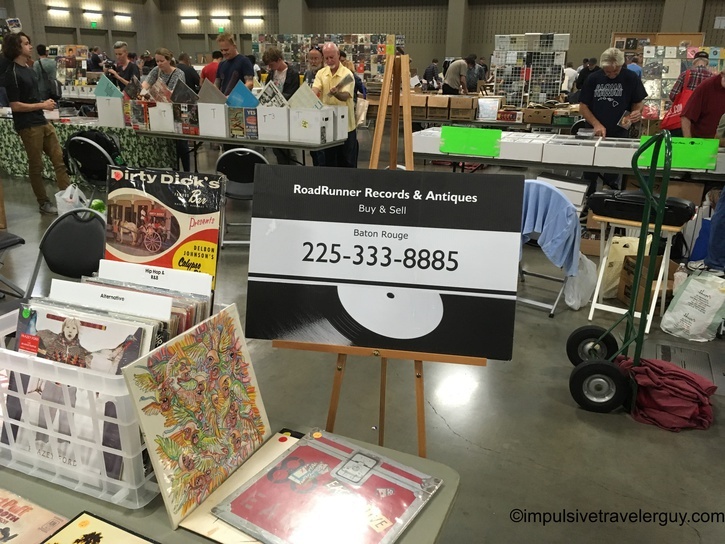 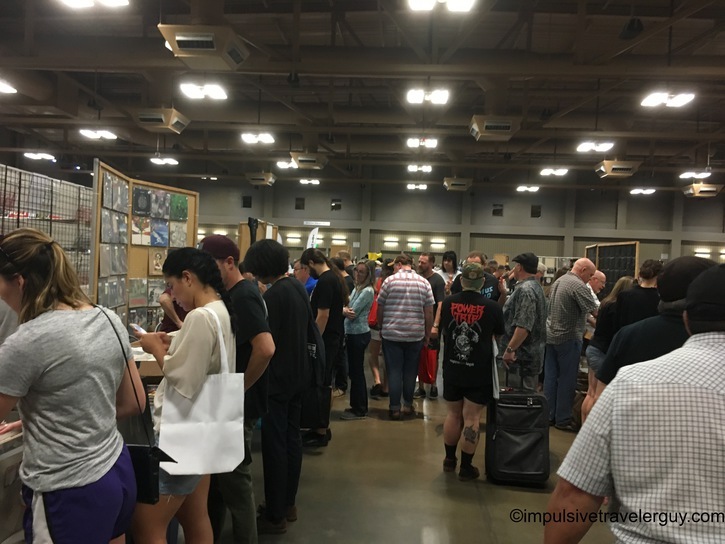 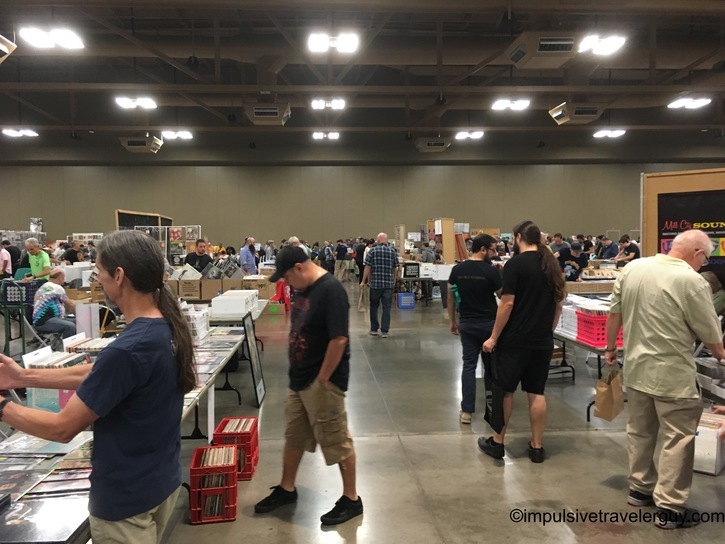 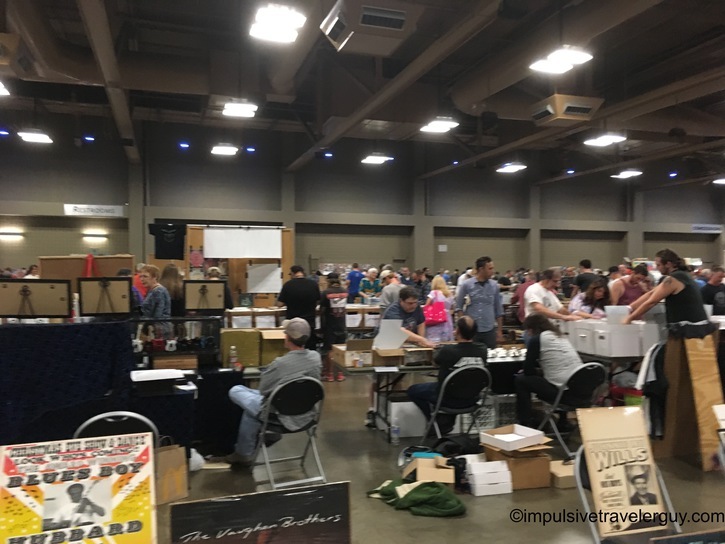 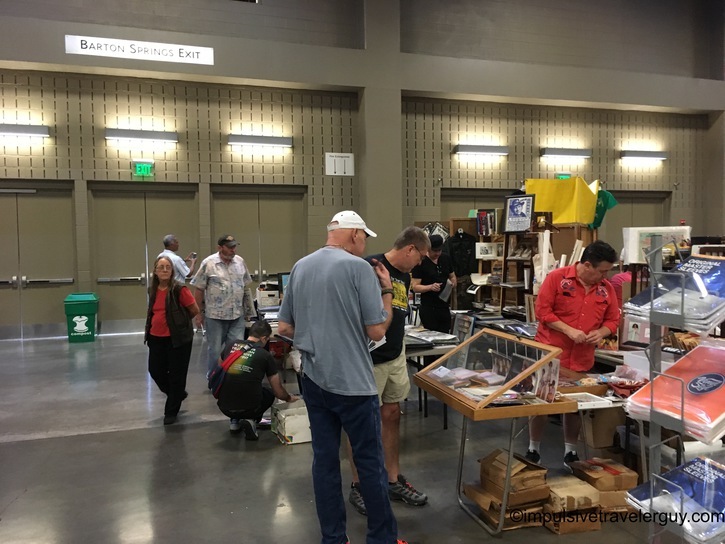 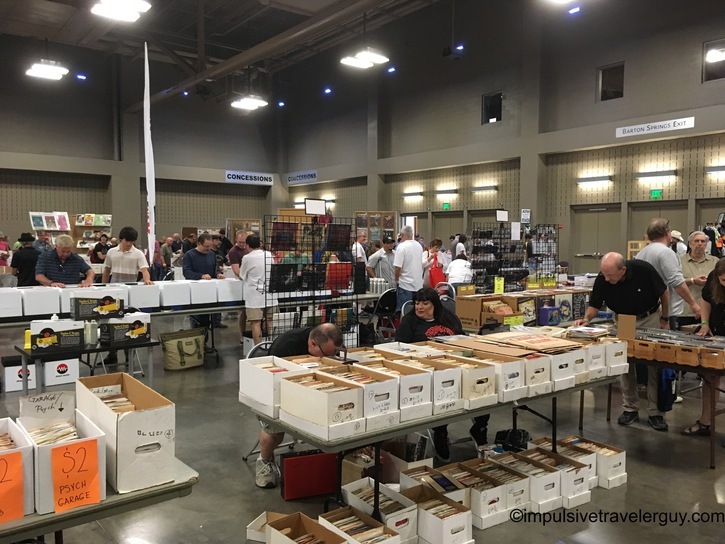 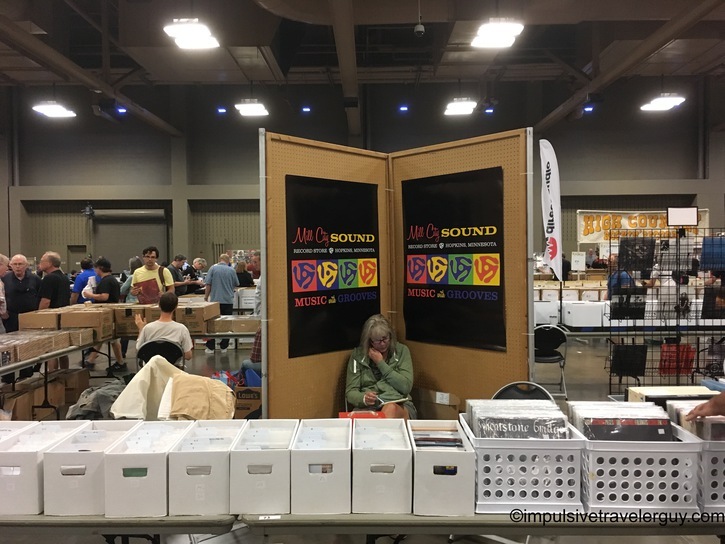 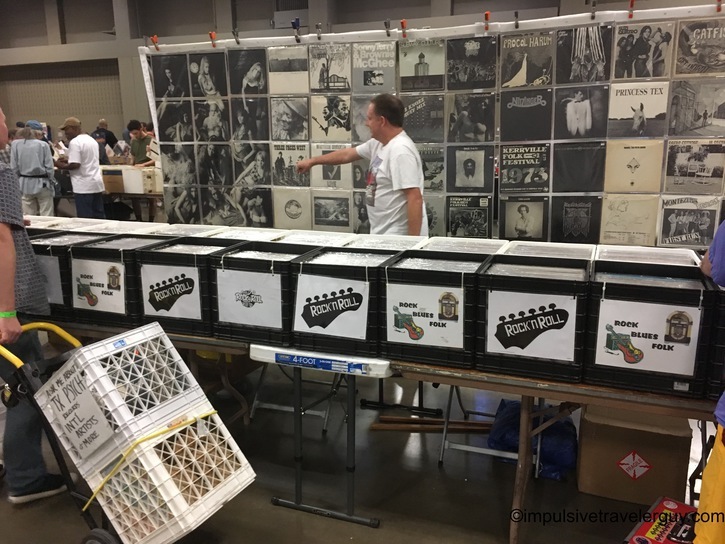 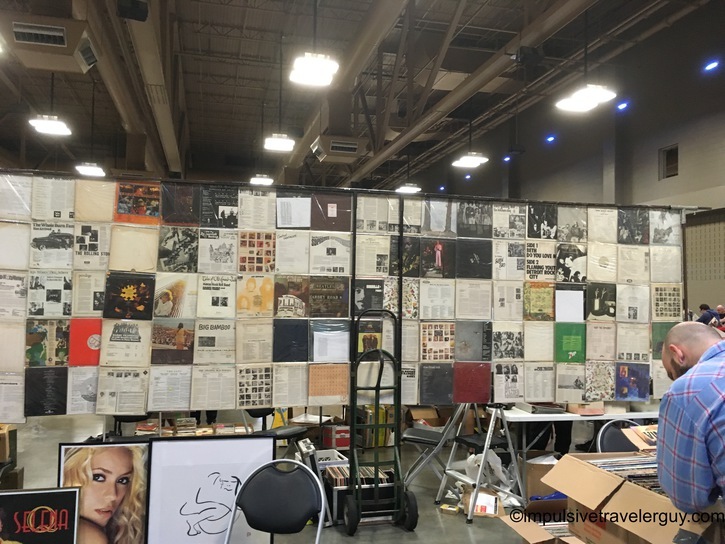 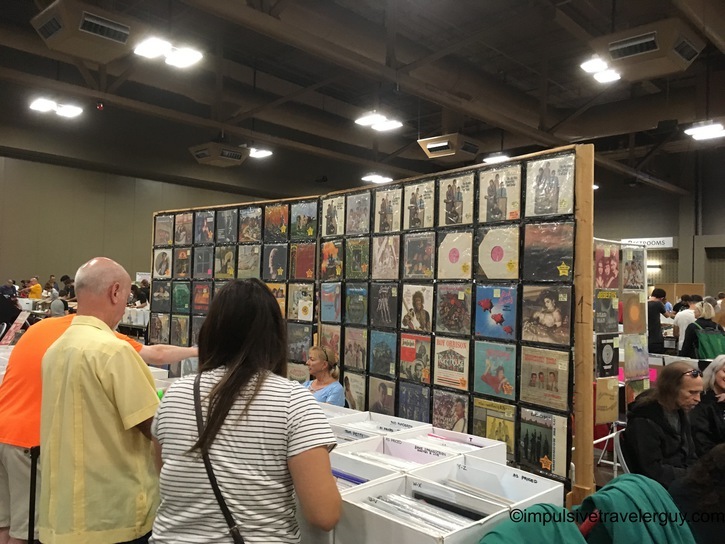 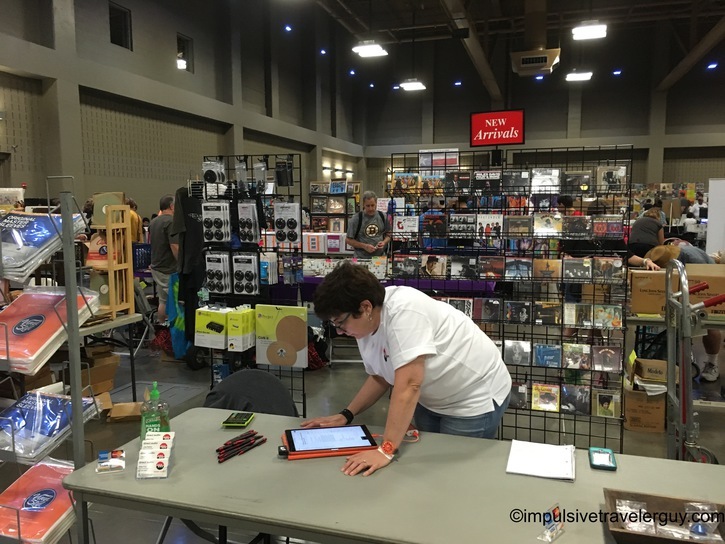 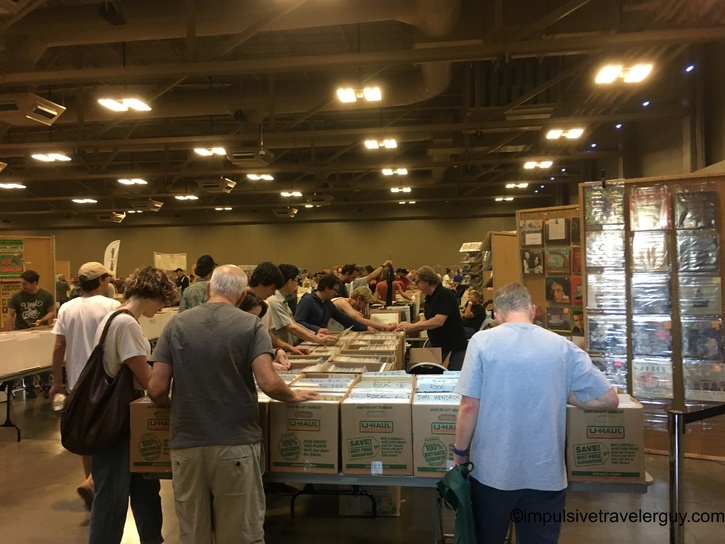 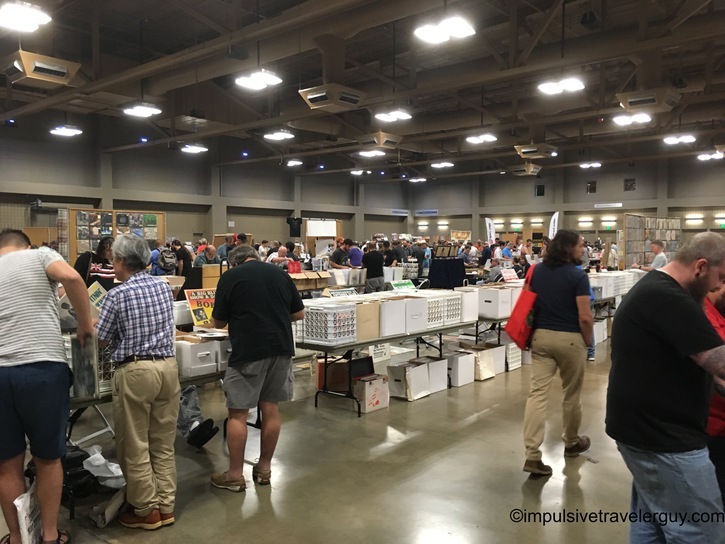 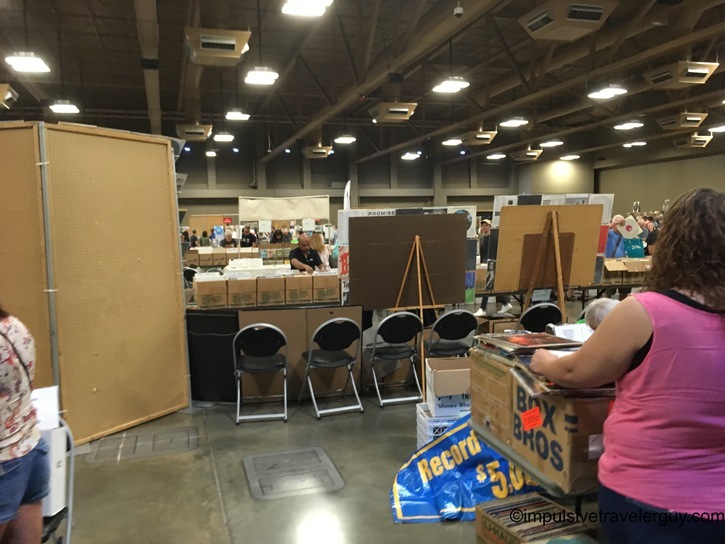 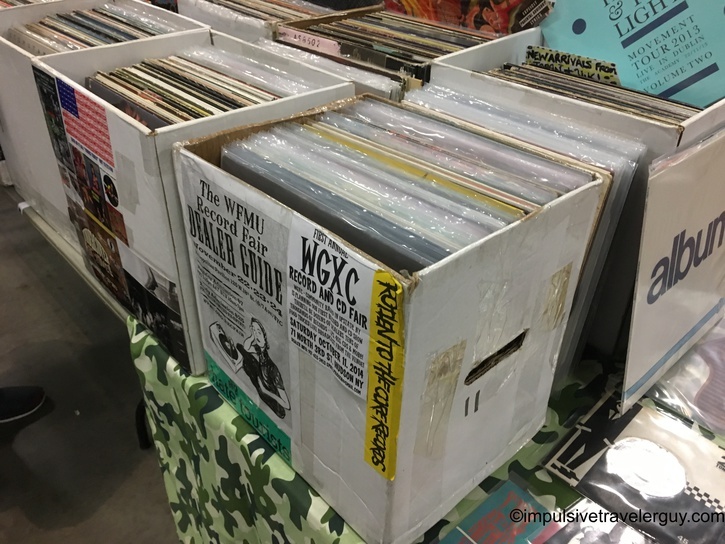 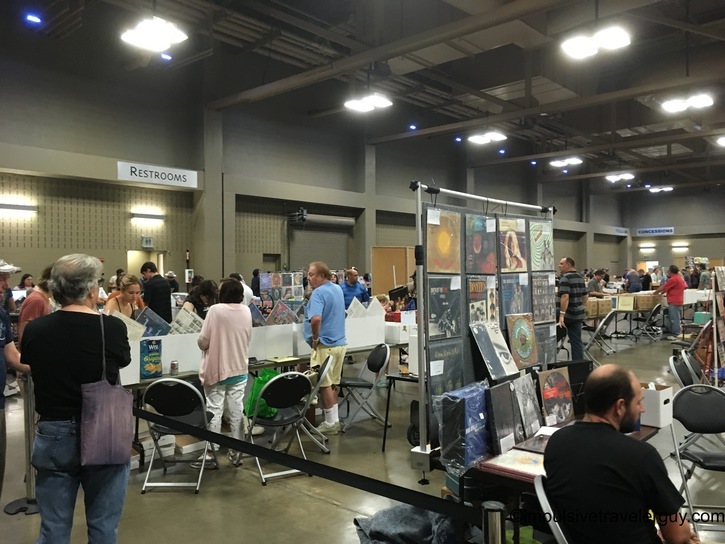 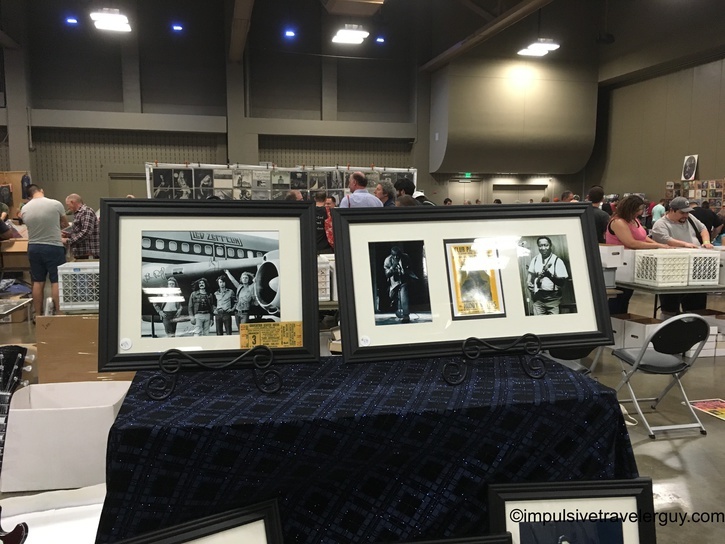 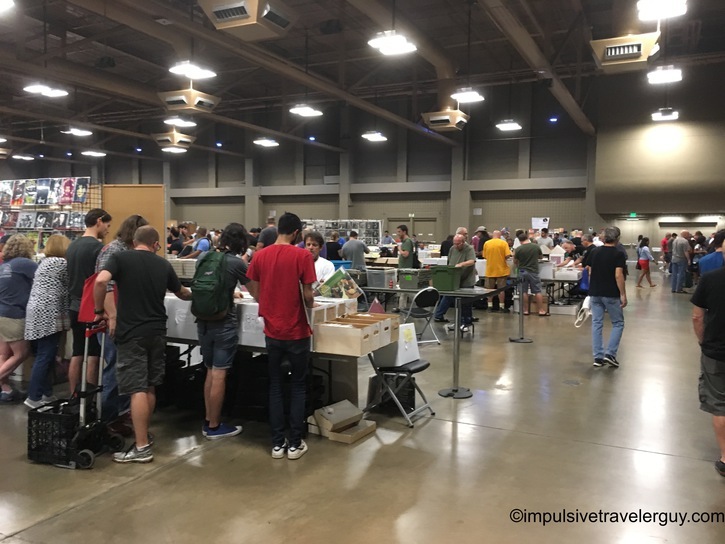 I saw an advertisement for the Austin Record Convention and I decided I needed to go. 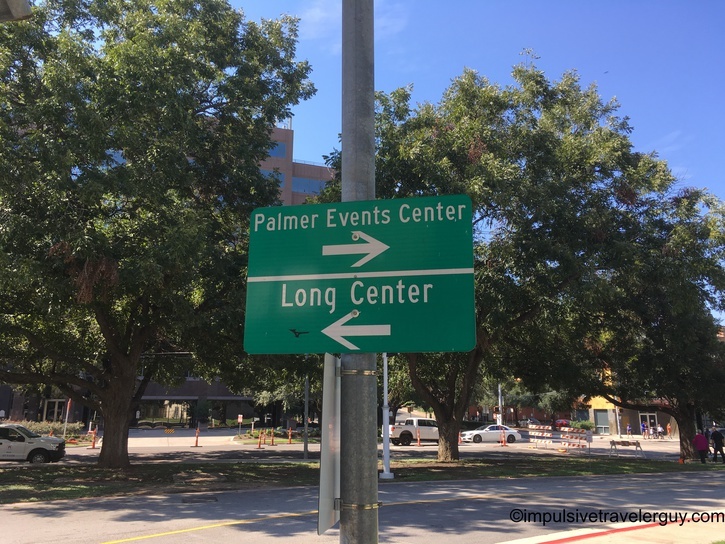 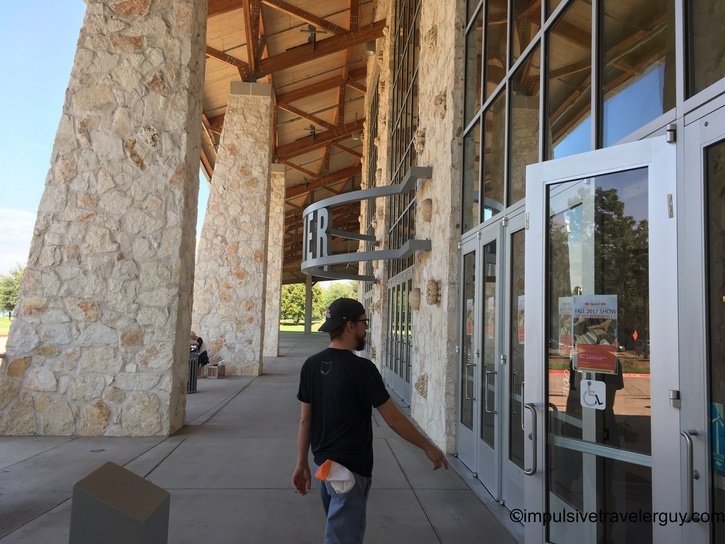 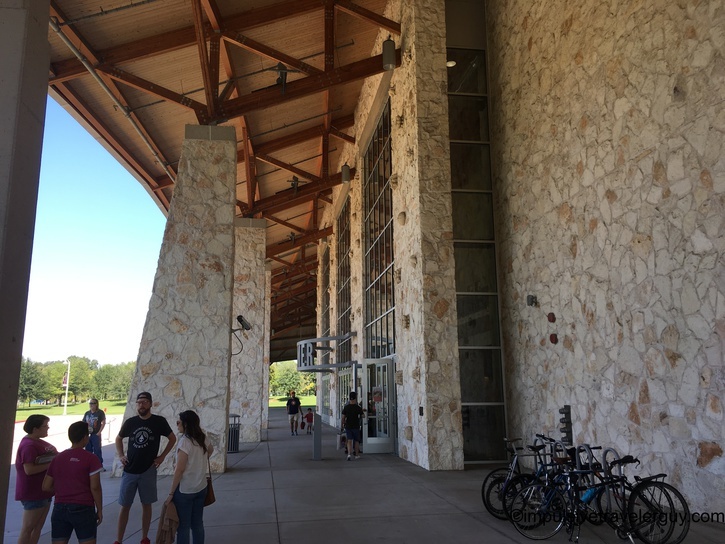 It was at the Palmer Events Center on the south side of town. 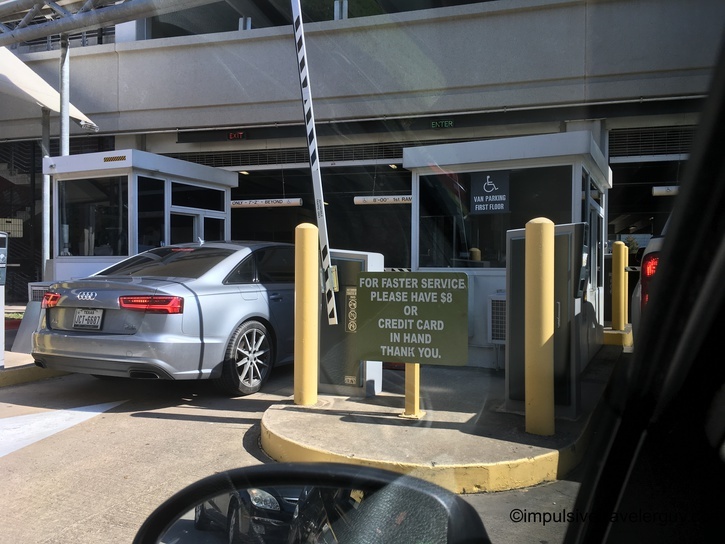 Victoria and I got in the car and headed there. 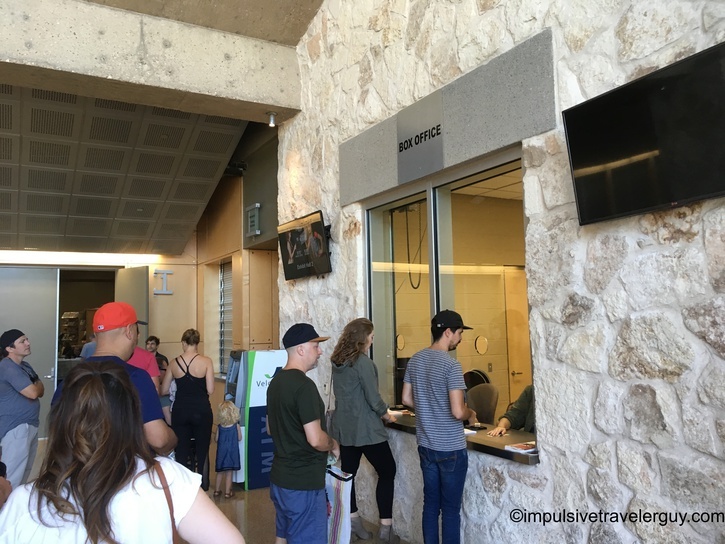 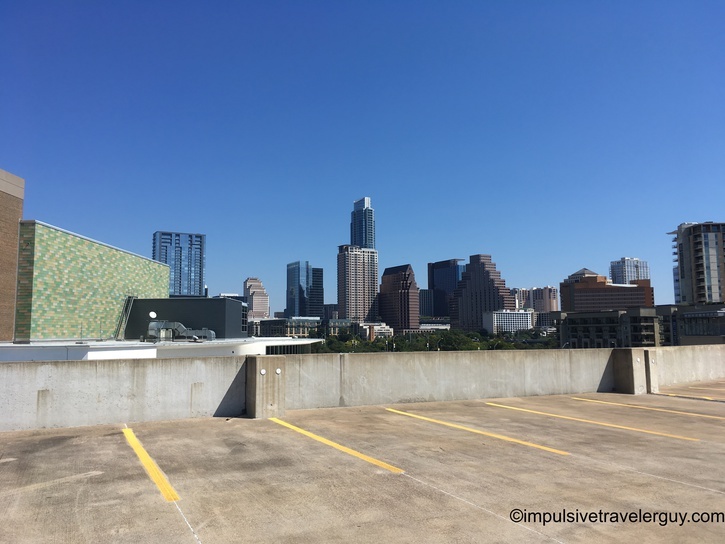 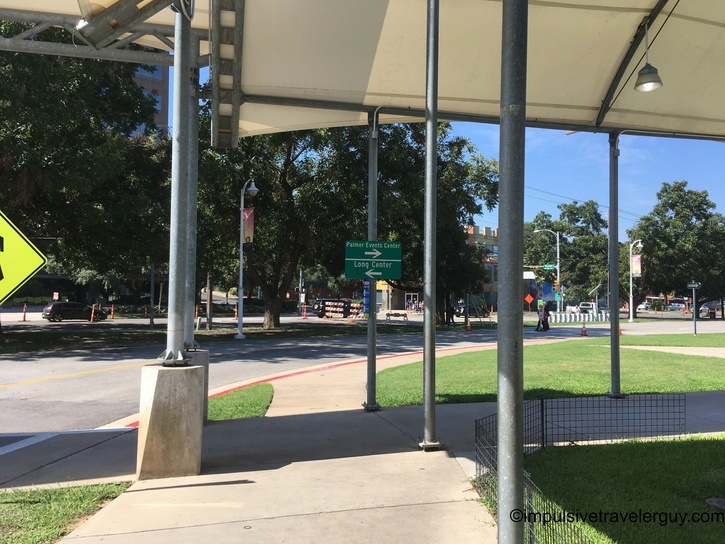 I found out it was $5 to get in (pretty cheap overall), but it was $8 to park (I guess cheap to midrange for Austin parking prices). 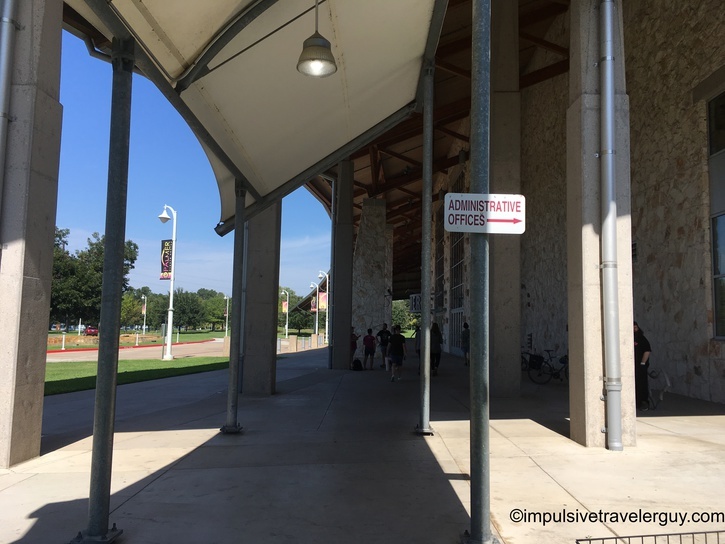 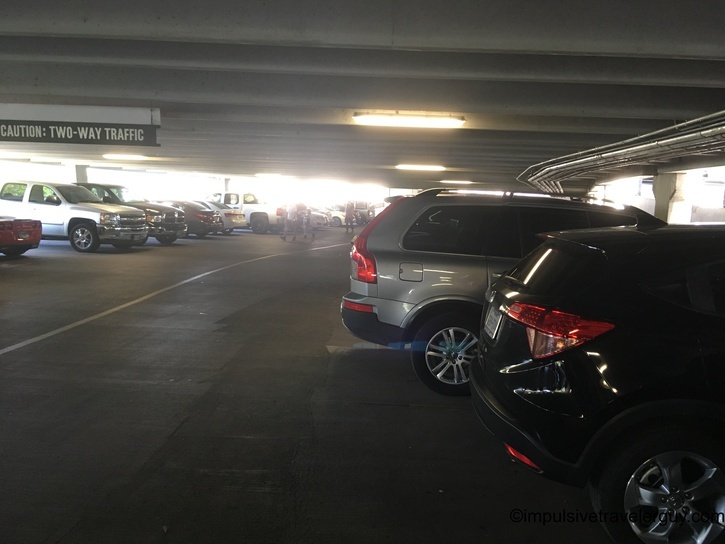 We bought our parking pass, parked in the packed parking garage, and then made our way down to the main entrance. 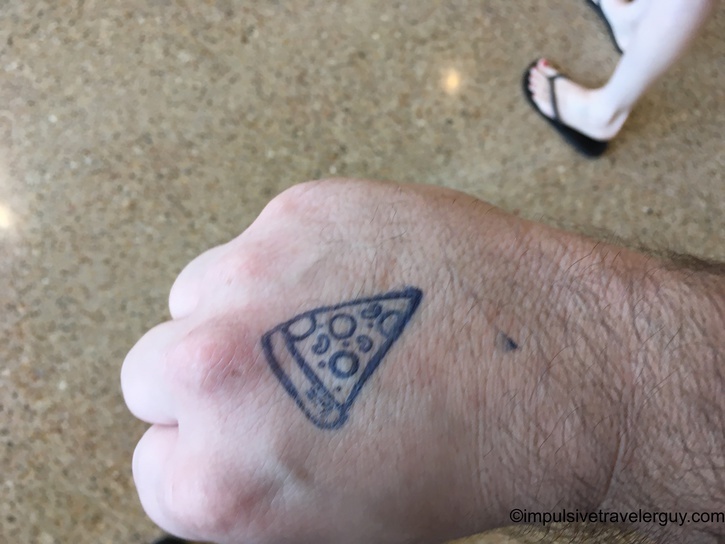 They stamped our hands with this cool pizza logo once we paid. 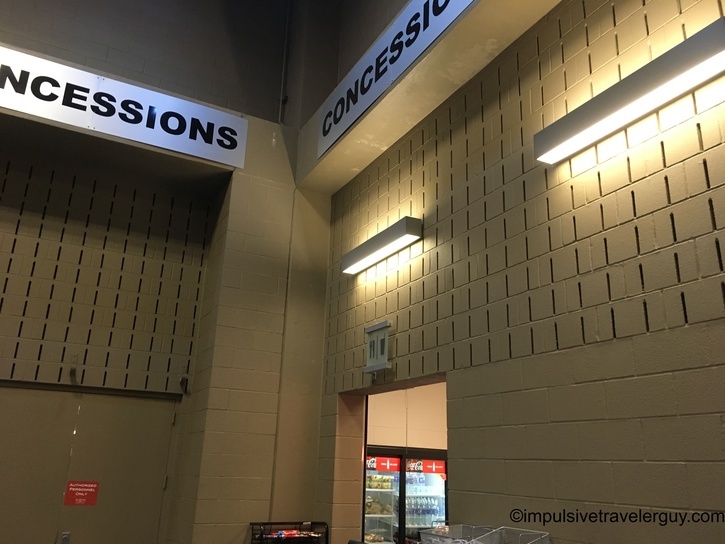 Soon we were inside. 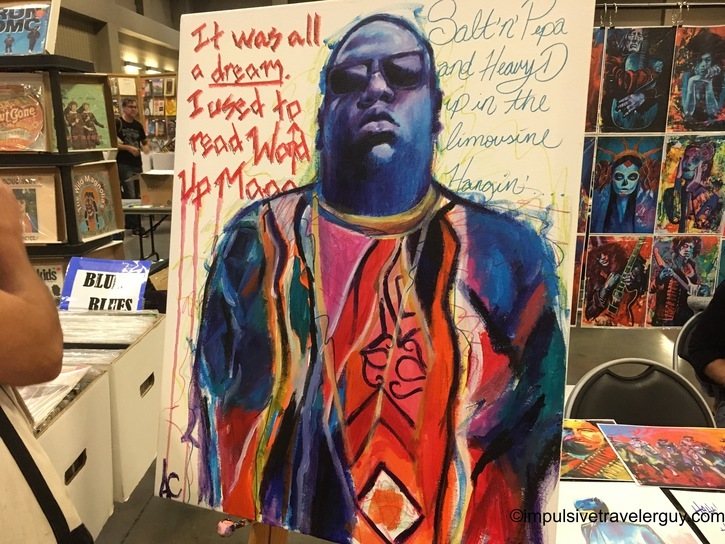 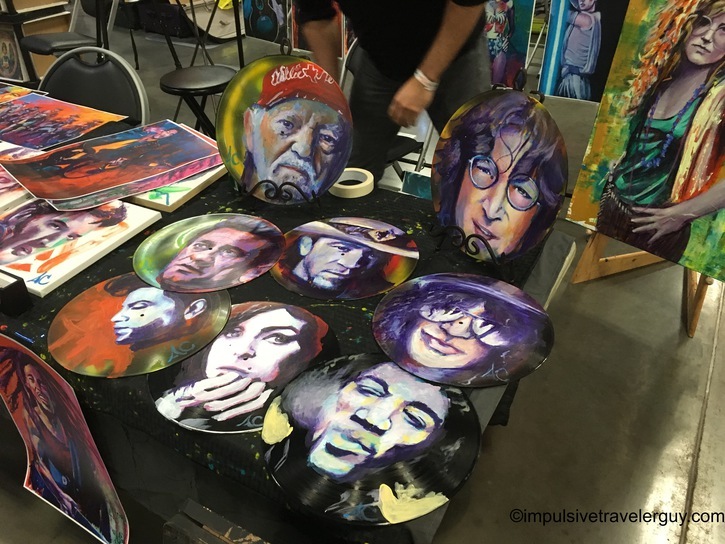 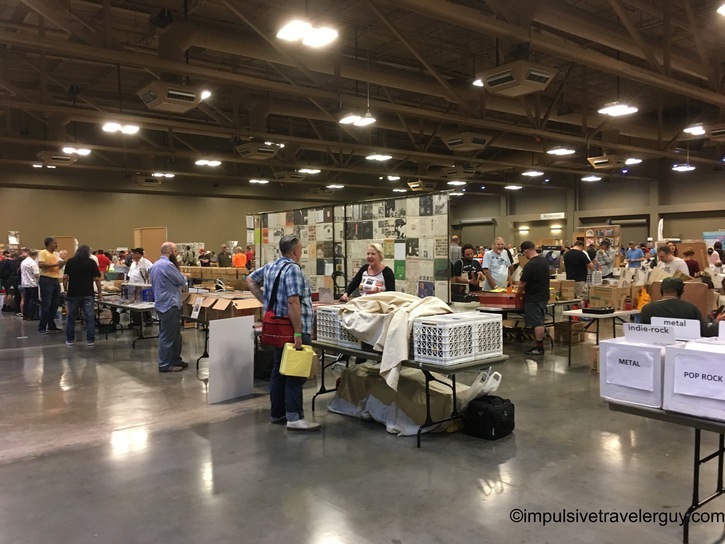 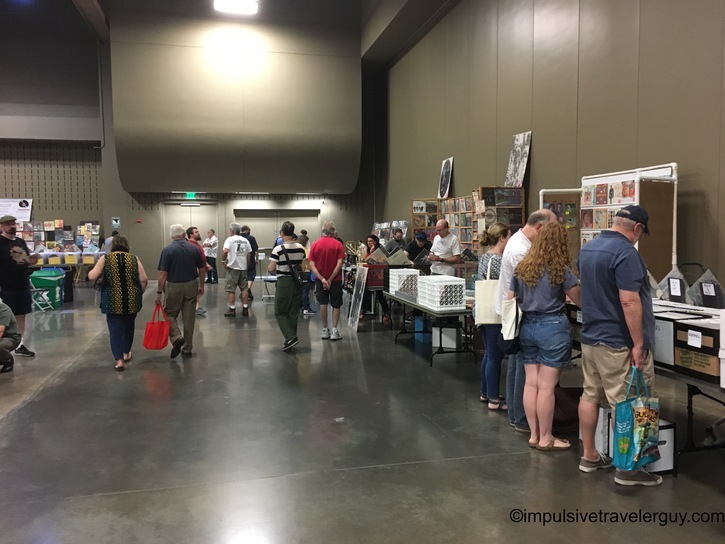 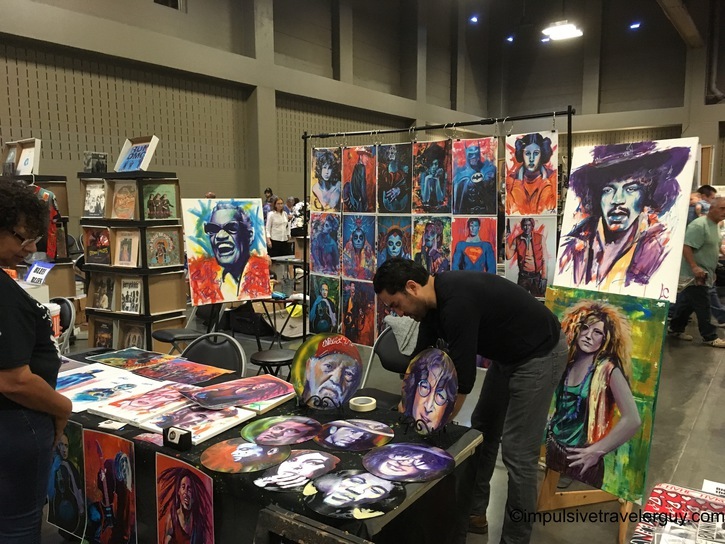 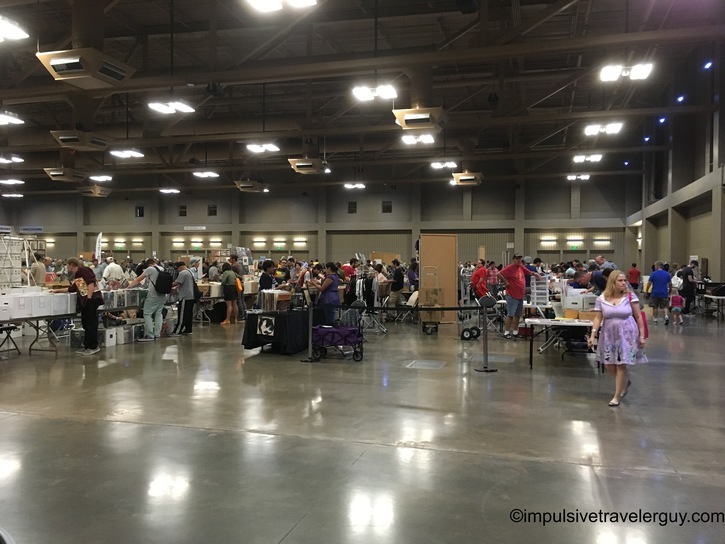 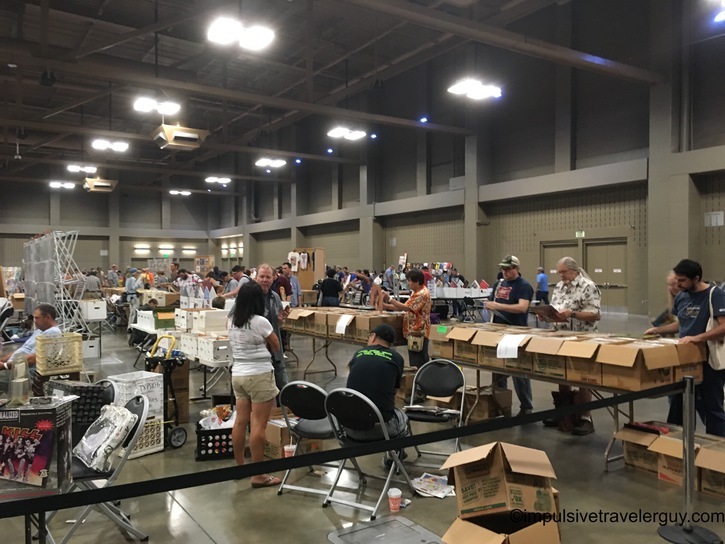 The sheer size and amount of different vendors was the first thing I noticed. 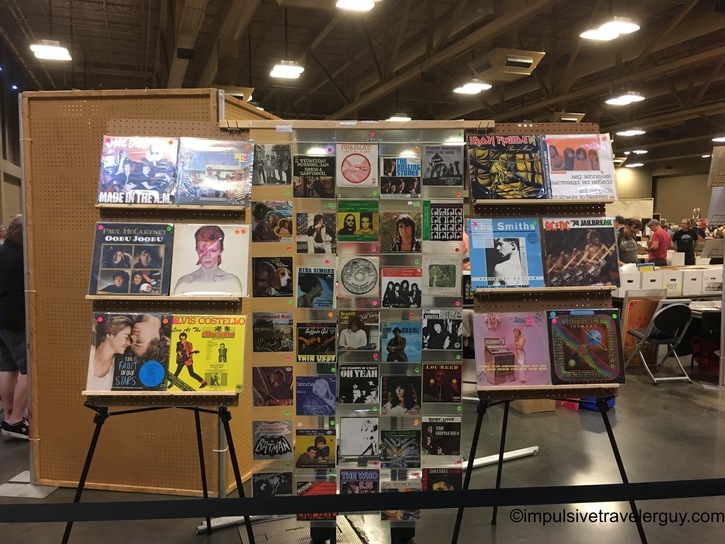 I also noticed some really cool albums out in display out front and also a concession stand if I got hungry. 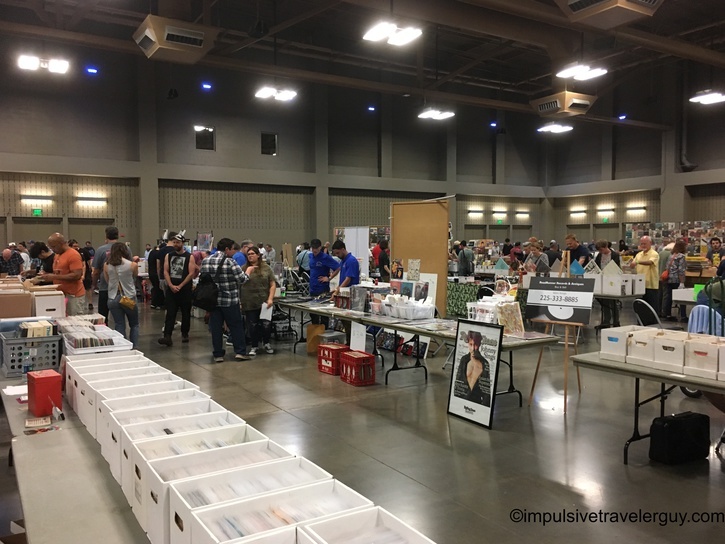 Like I said, the sheer volume of stuff there was amazing! 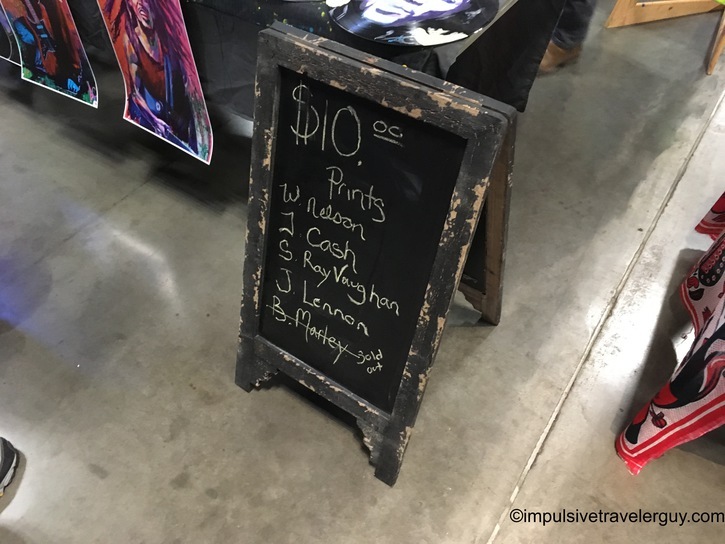 I just walked around and took pictures of everything. 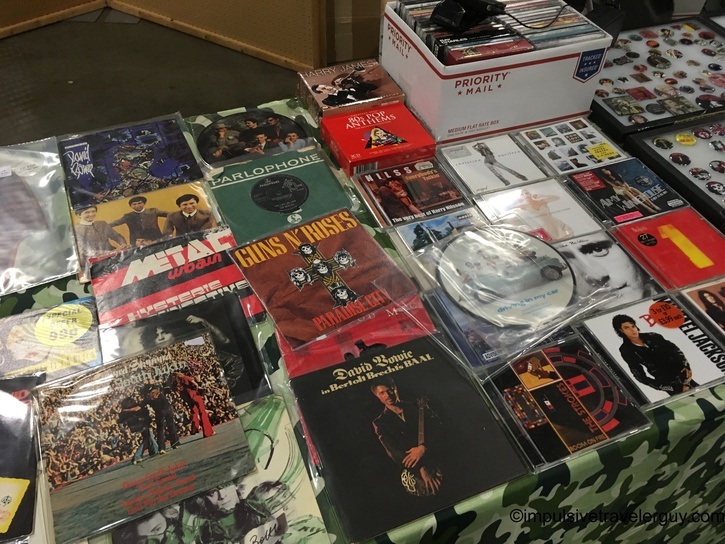 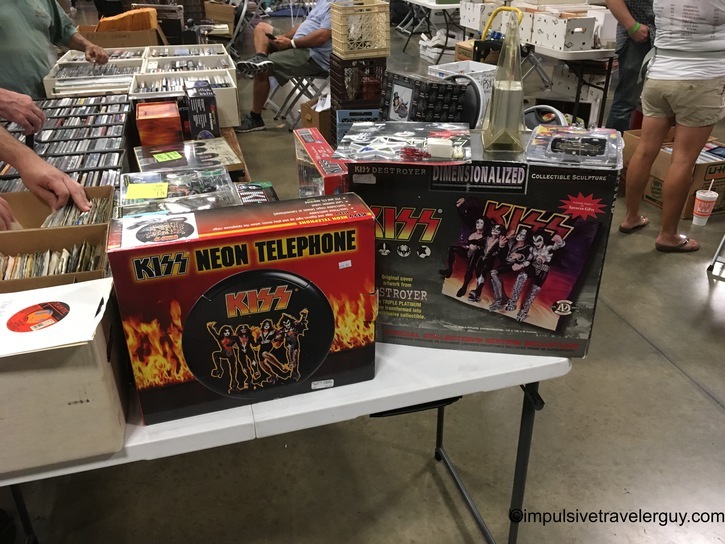 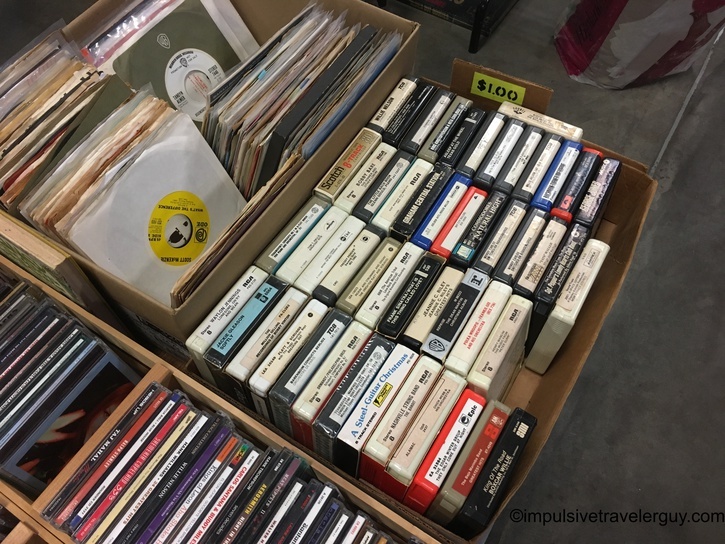 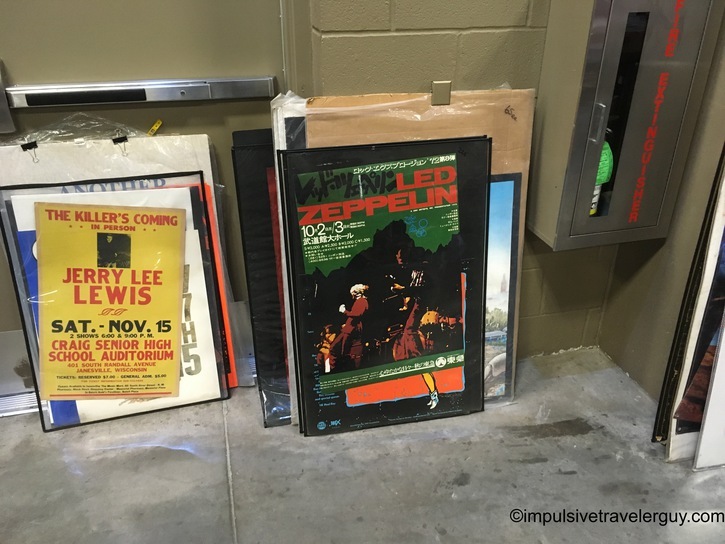 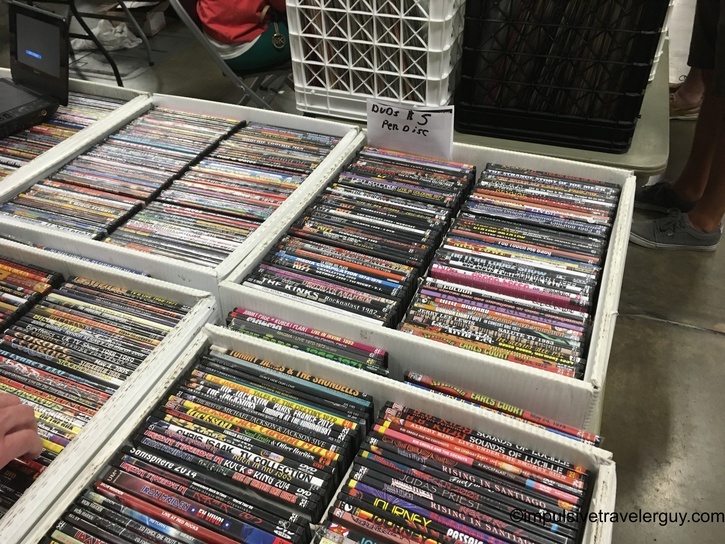 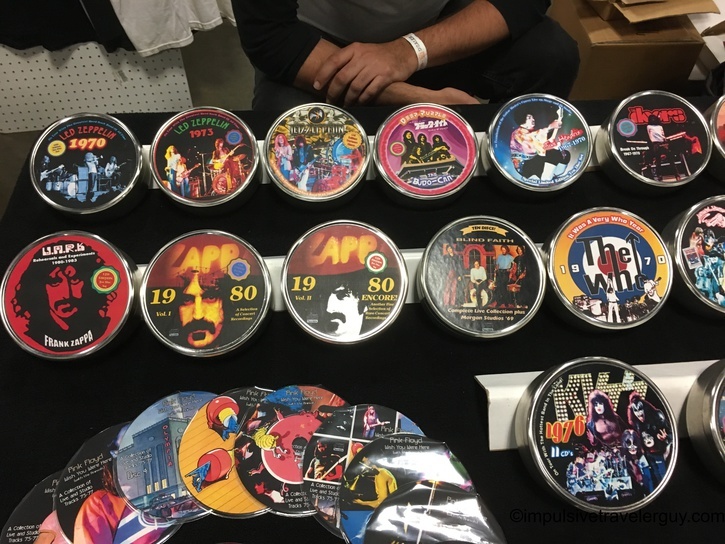 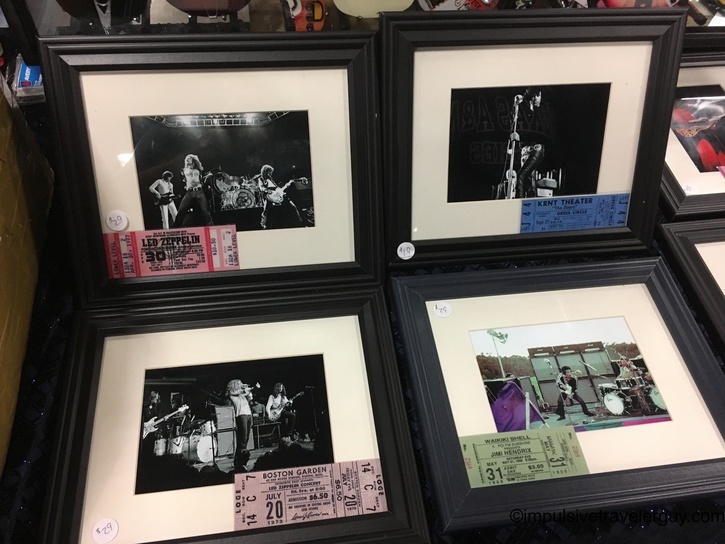 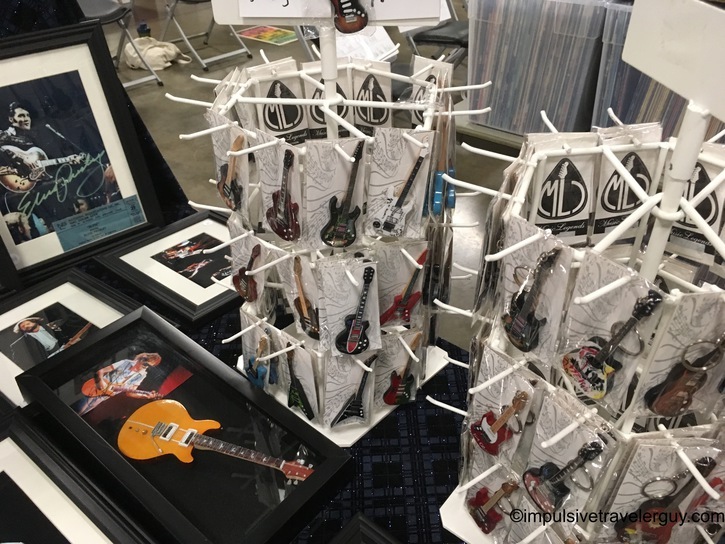 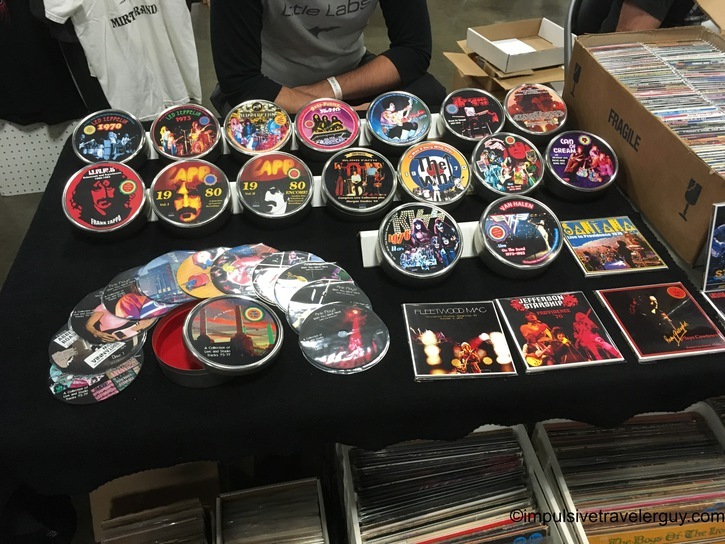 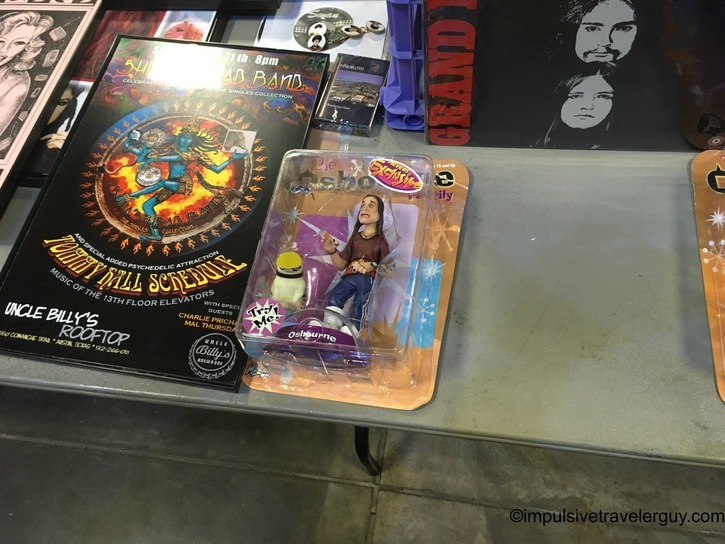 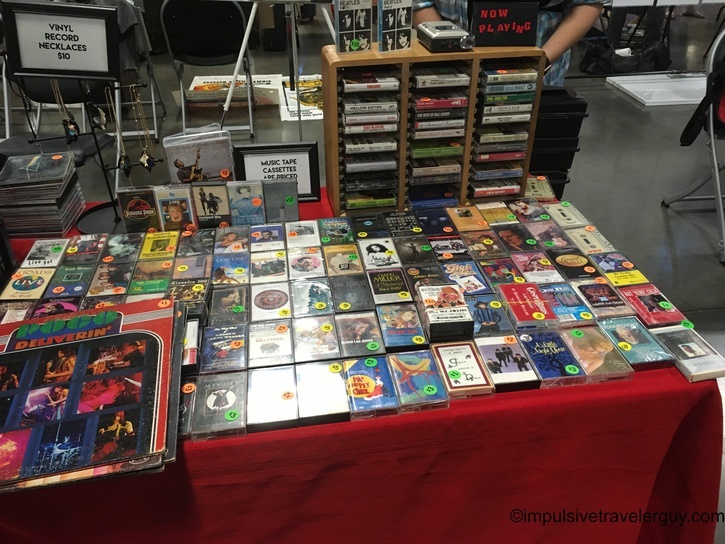 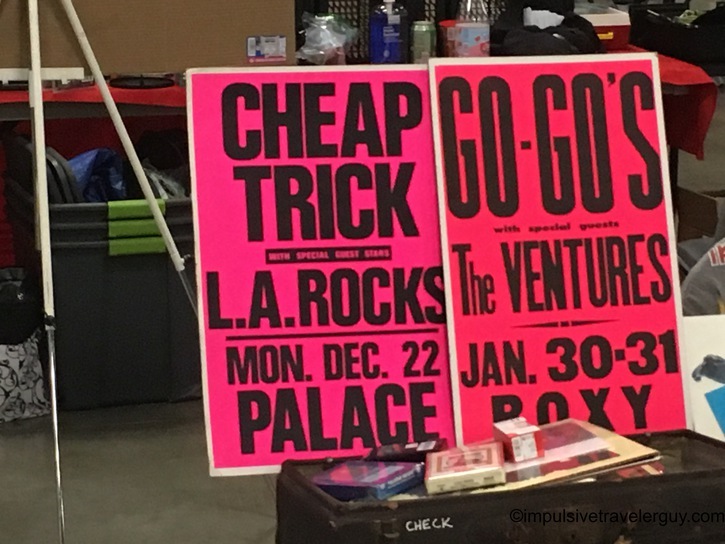 While this was mainly based on records, I did find there was other stuff like CD’s, cassette tapes, 8-tracks, toys, posters, t-shirts, and some cool artwork. 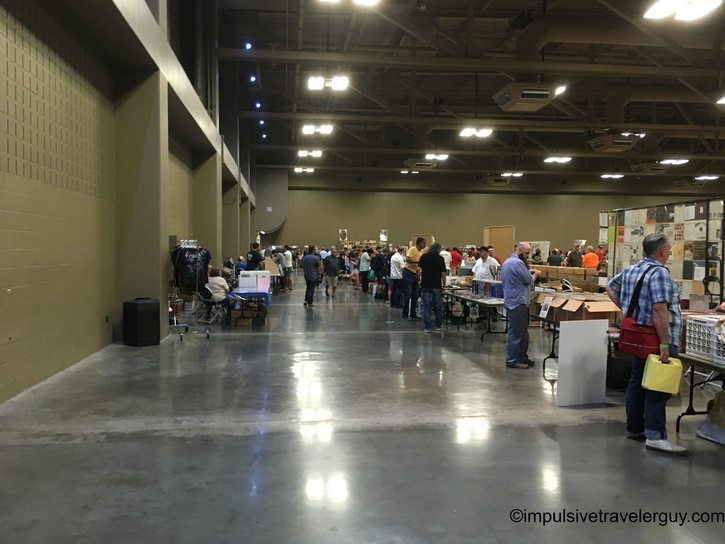 I walked around and looked at everything. 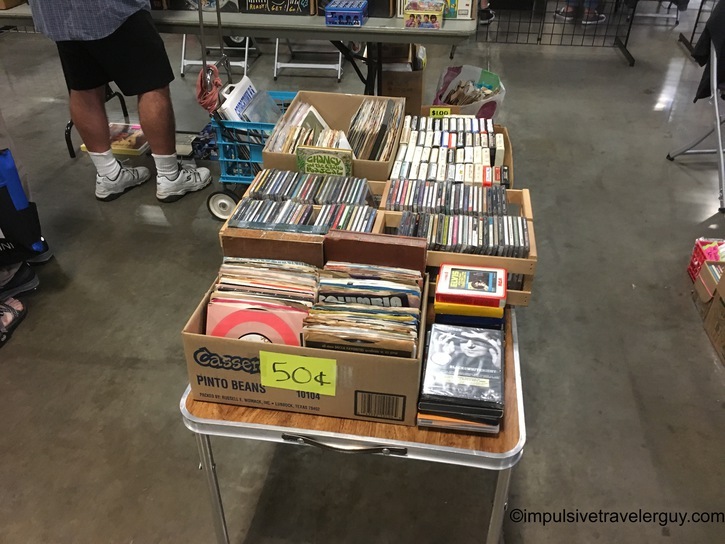 I didn’t really find any CD’s I wanted. 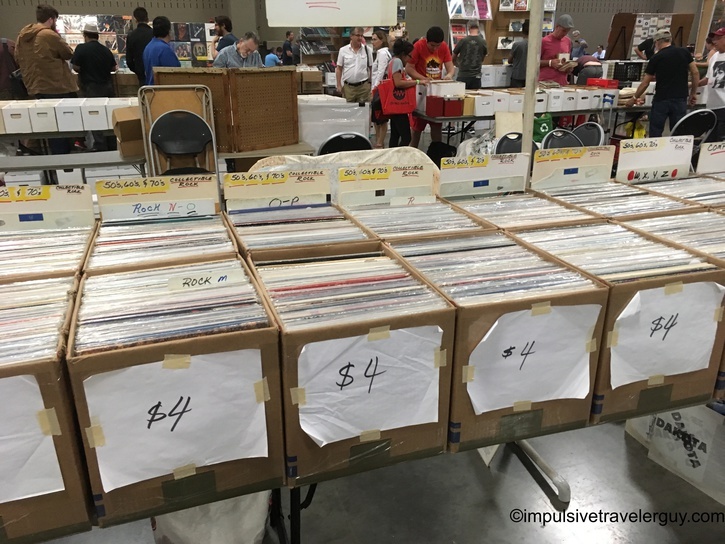 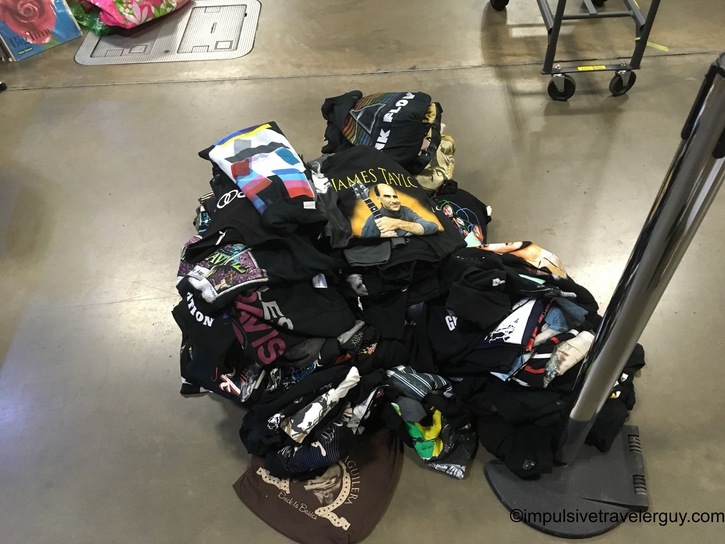 I’m sure if I would have spent a bunch more time, I probably would have came out with stacks of them, but for the time being I was just looking to see if any caught my eye right away. 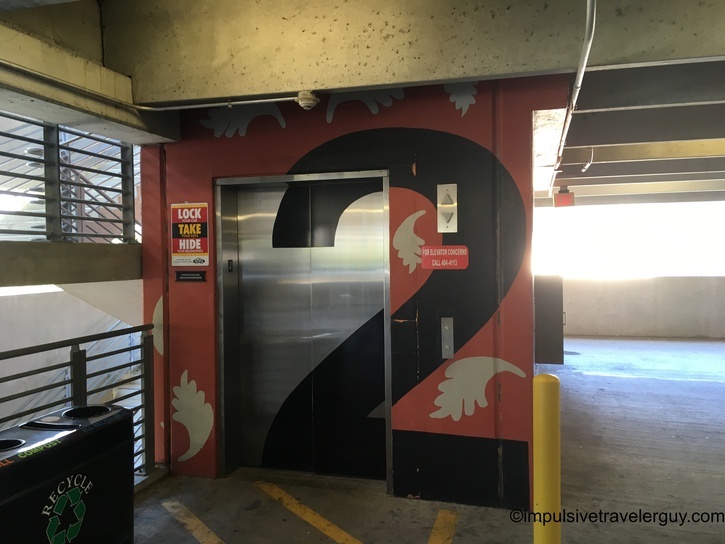 We walked back to the car and I took a wrong turn in the parking garage. 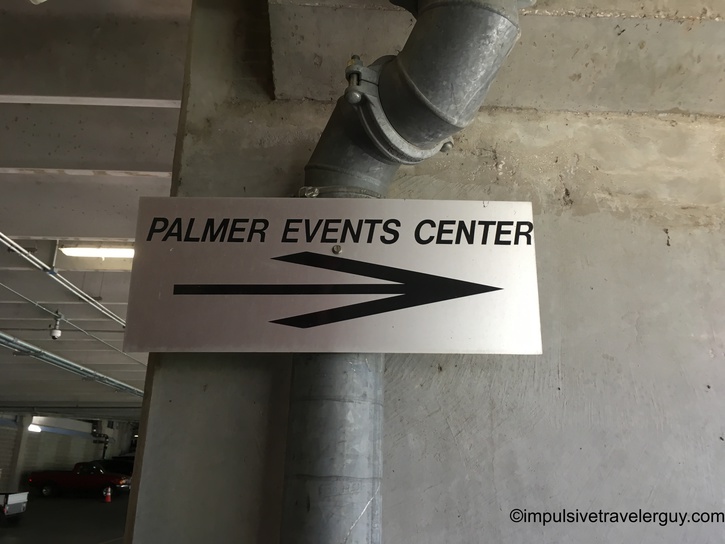 This led me up to the top floor, which was completely empty. 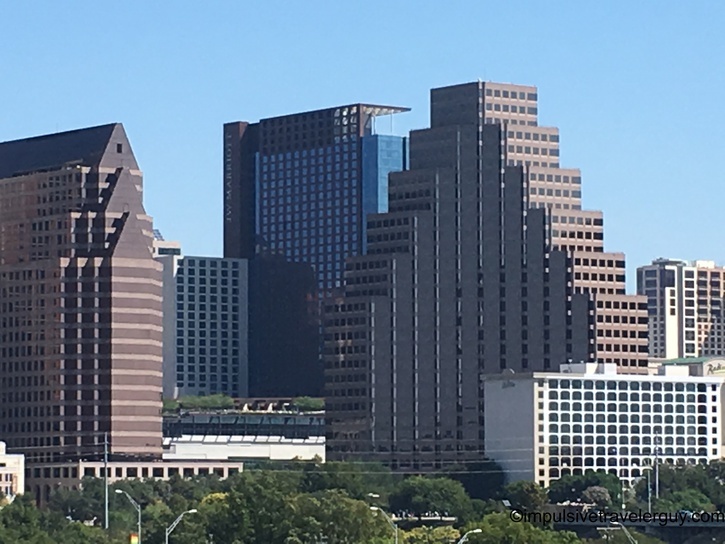 That worked to my benefit as I was able to get a nice view of the city. 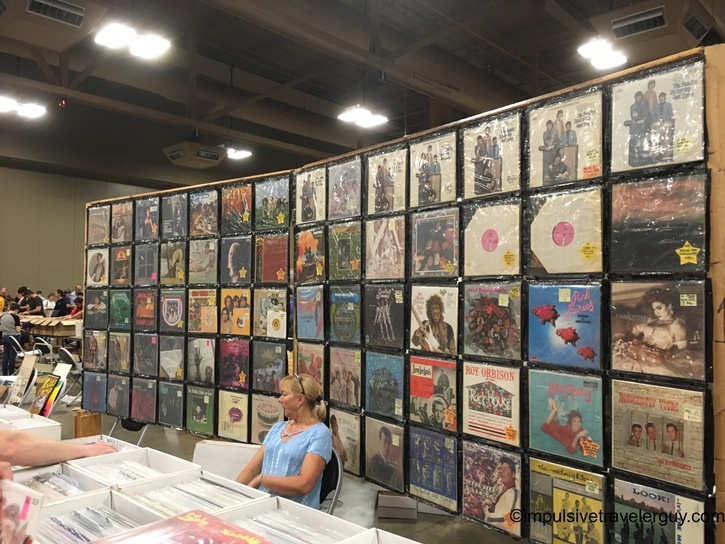 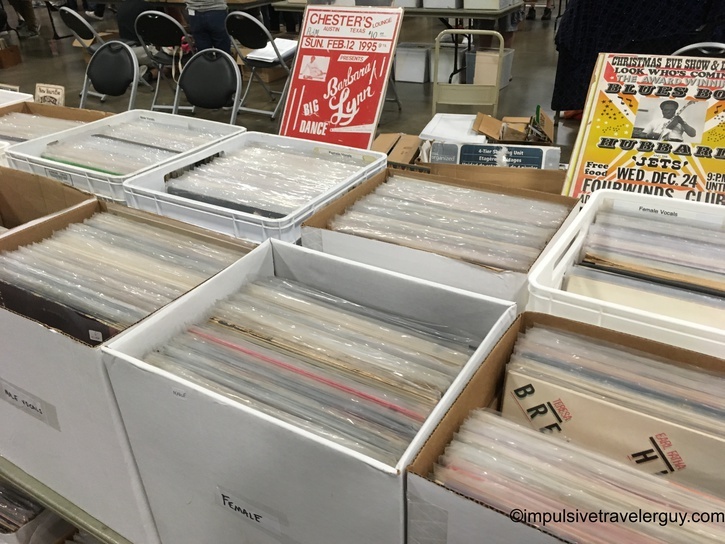 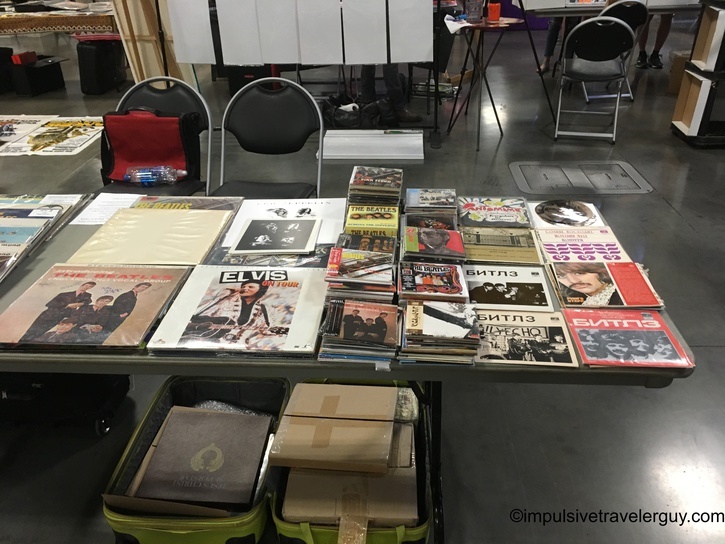 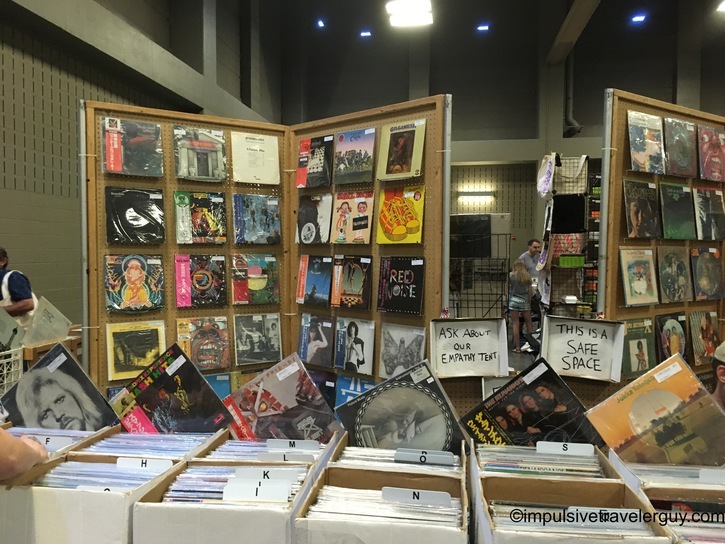 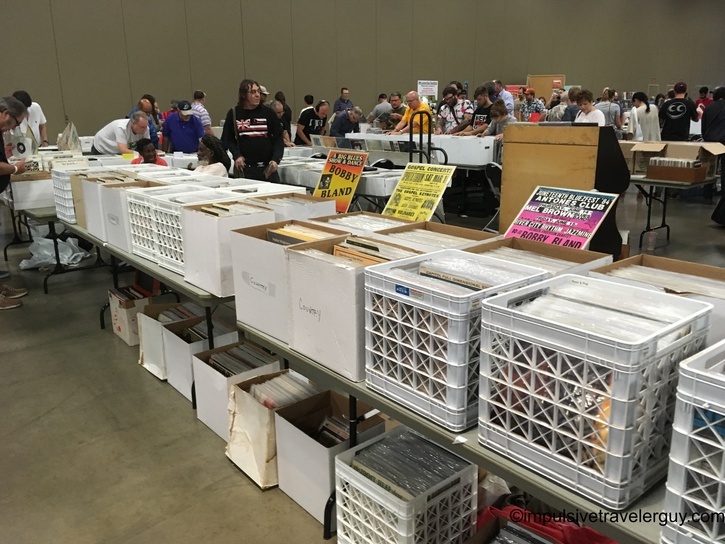 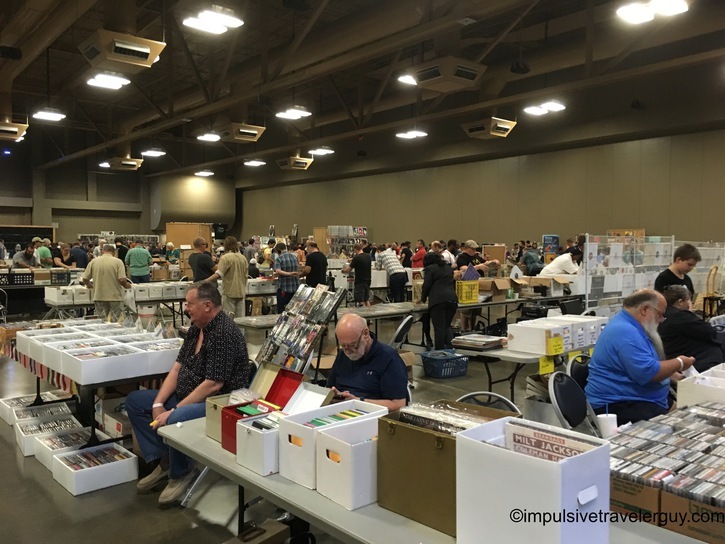 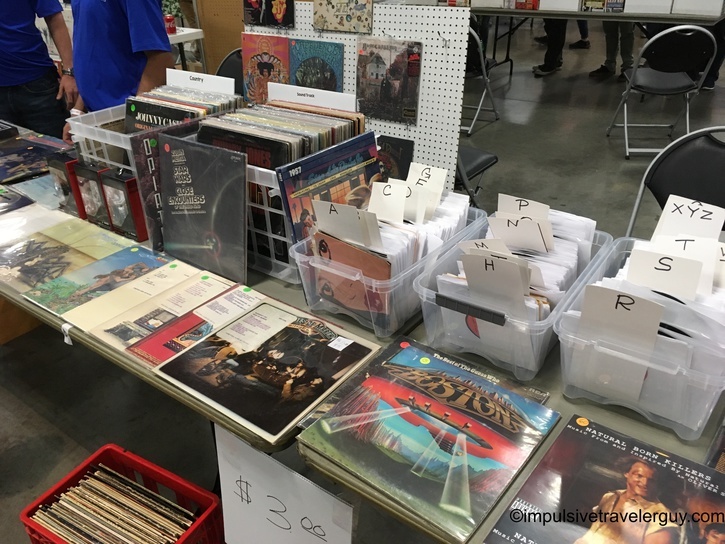 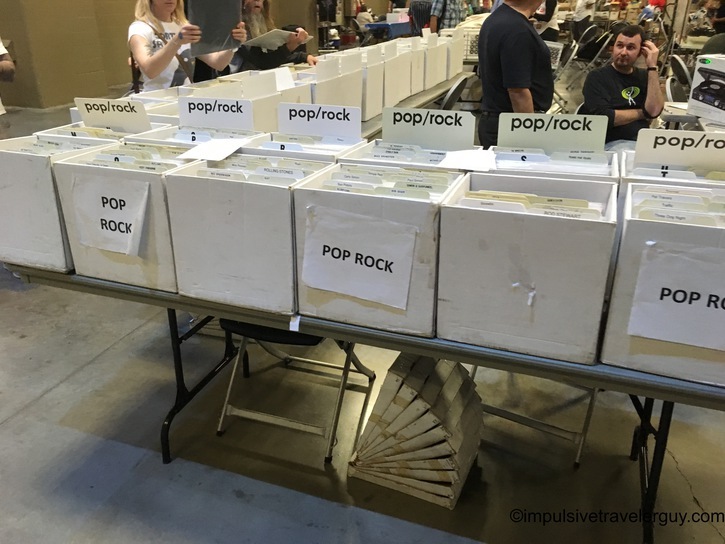 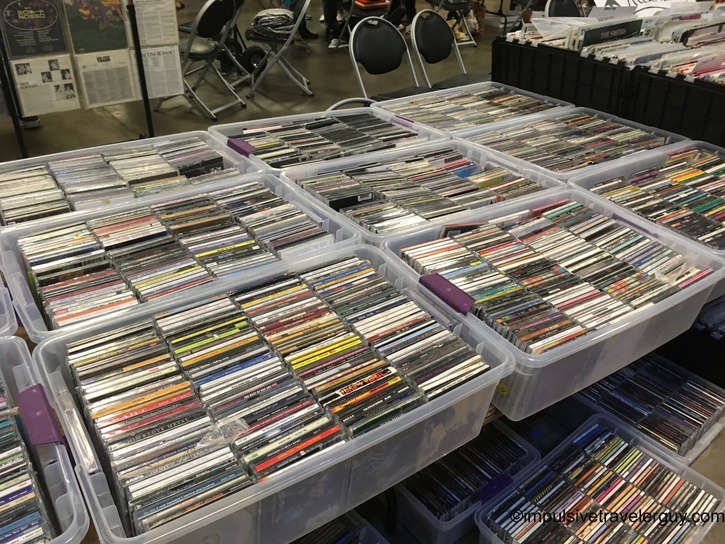 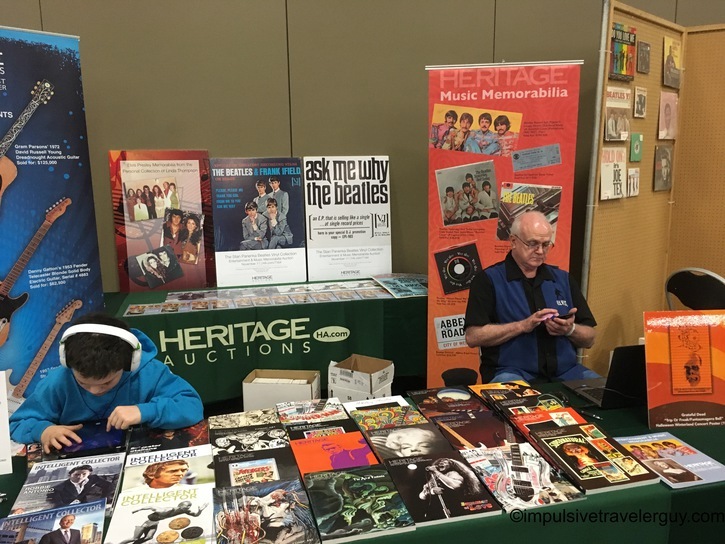 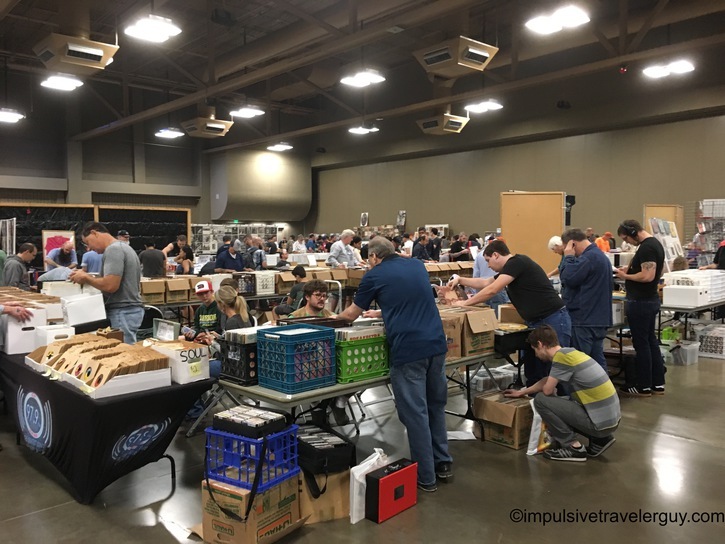 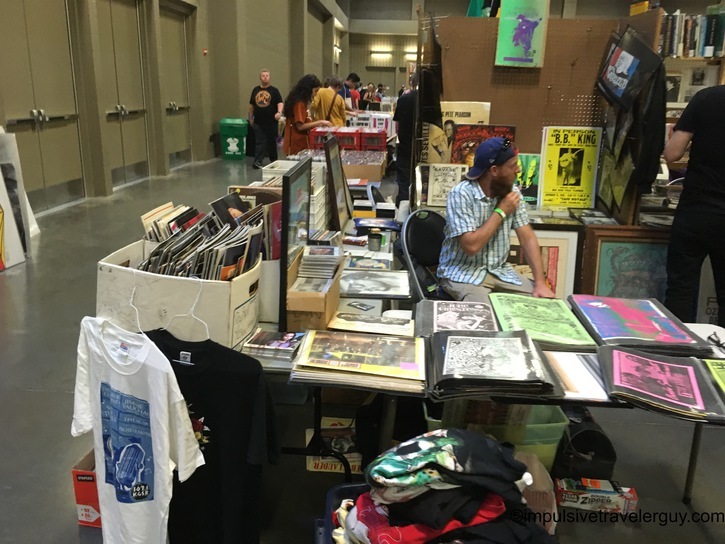 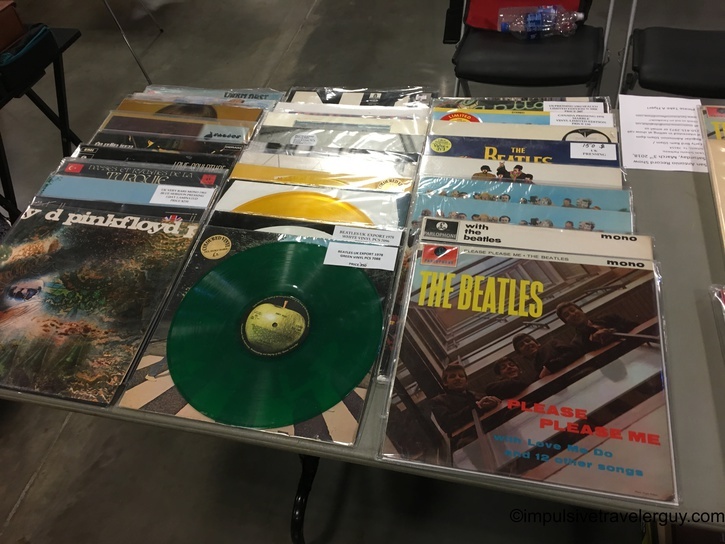 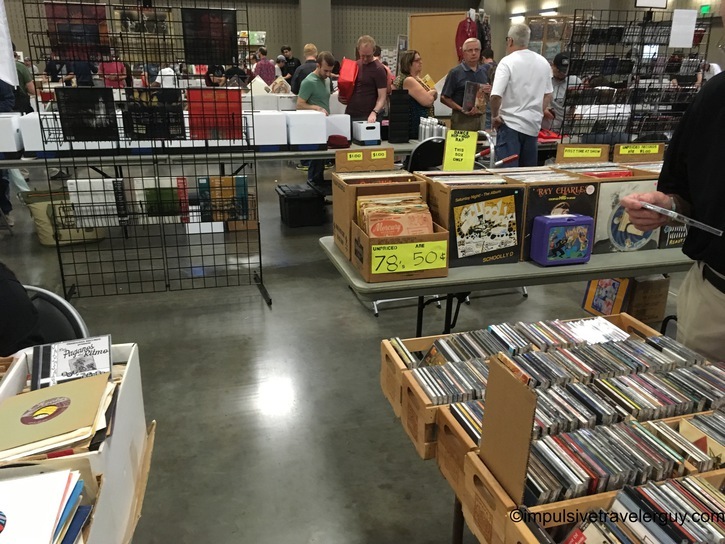 Going to this record convention was really cool. 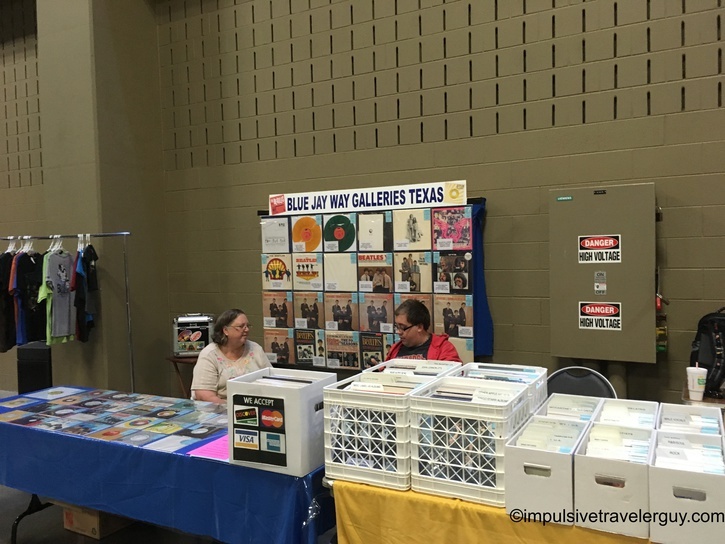 It appears they do it twice a year, so I’m sure I’ll be back to see what else they have. 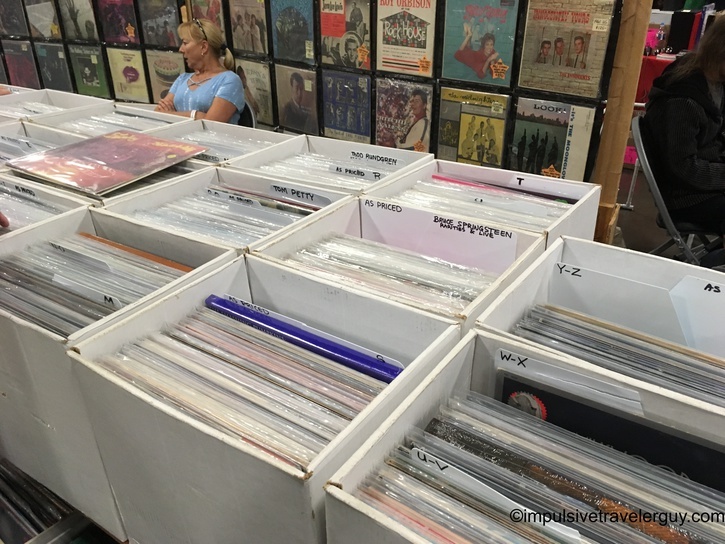 I’ll probably end up spending a lot more time (and money) the next time I do go there.